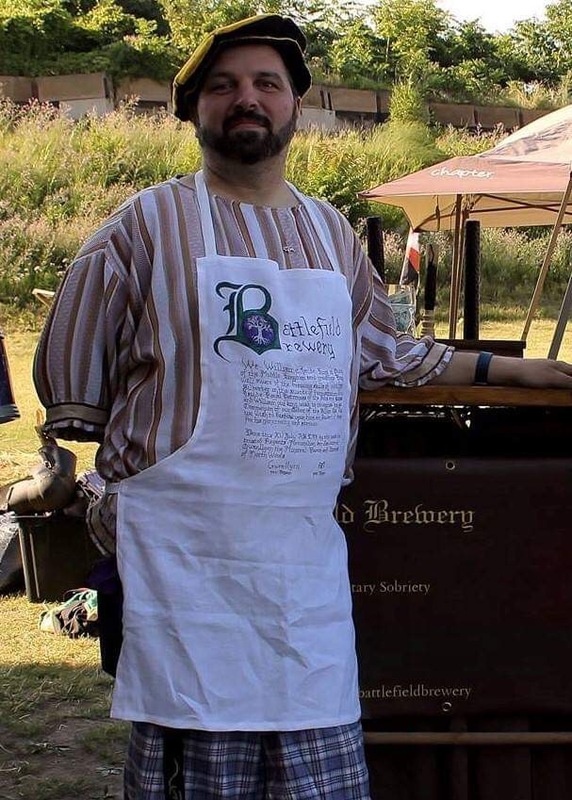 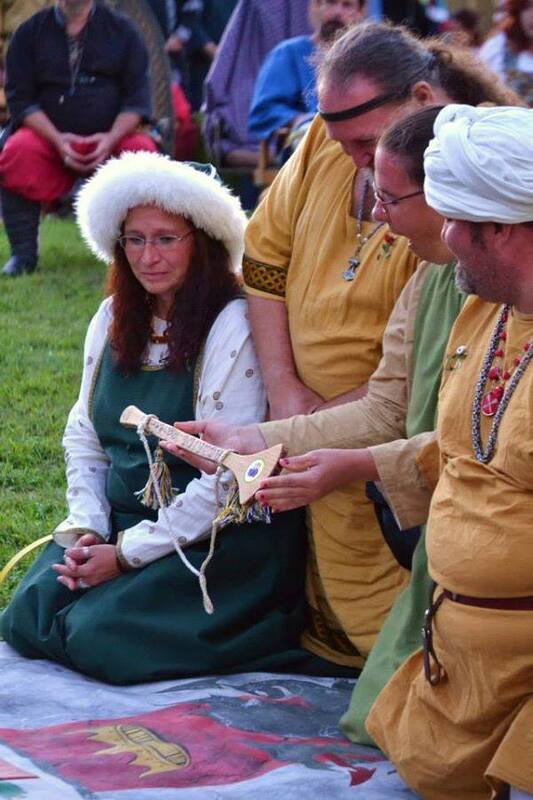 In the Medieval period and areas the SCA covers, reading and writing was a skill learned by few. 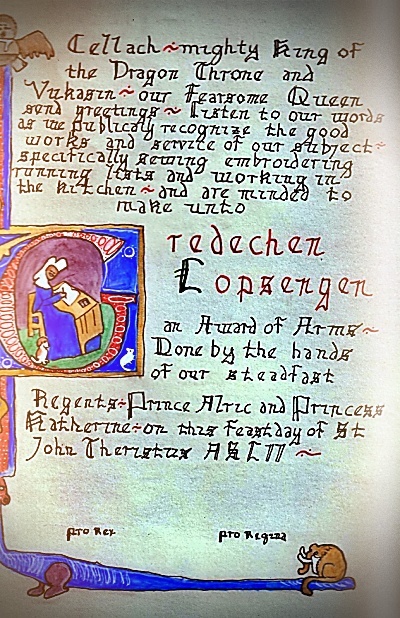 The professions with the most readers and writers were the priests and their counterparts the nuns. 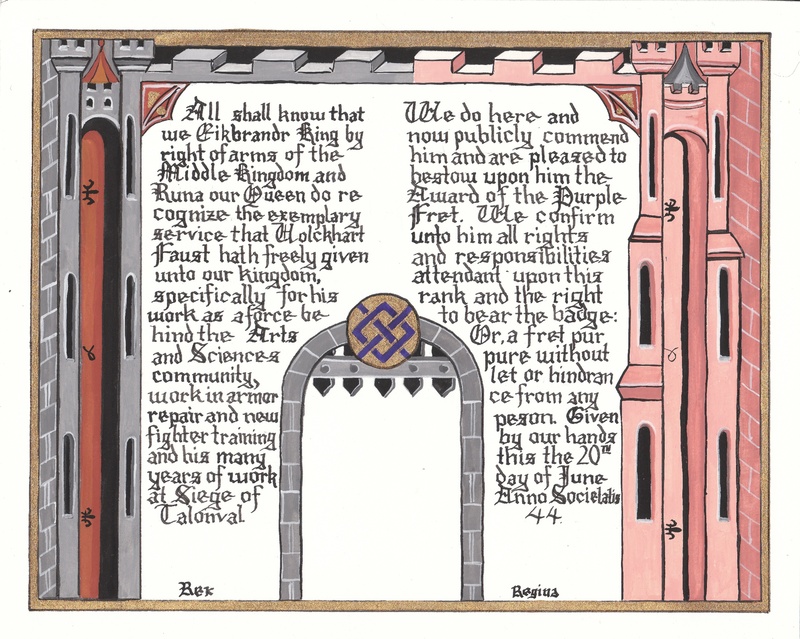 The next largest group was the scribes, from which the college of heralds came. 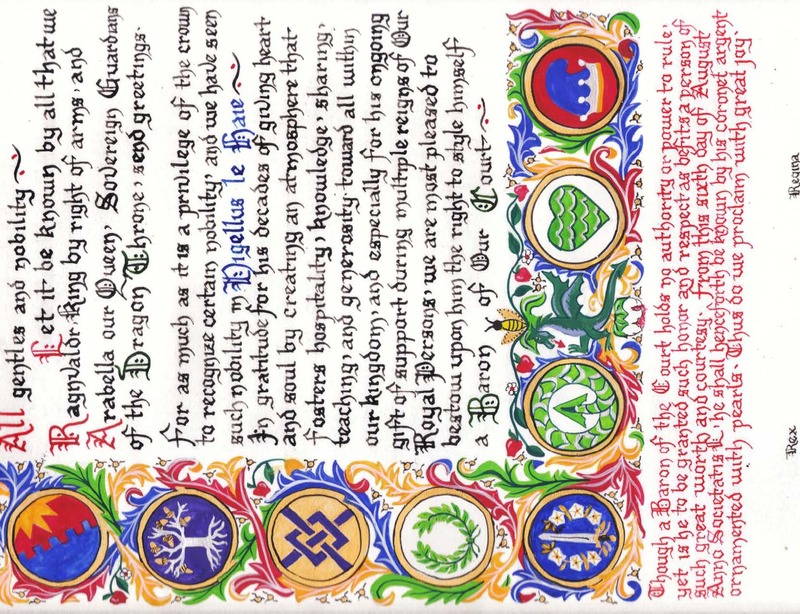 Many of the nobility did have some training as it was wise for a noble to know what was written especially in treaties or contracts. The scribes and nobles got their training from the priests. 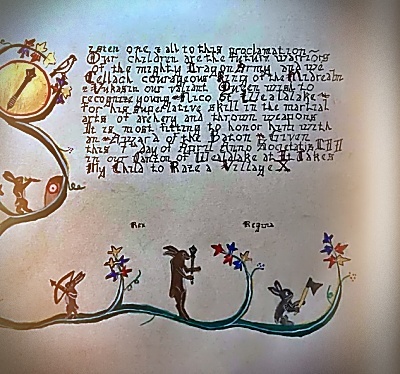 The limits on the learning to read and write were totally dependent on the free time you would have. 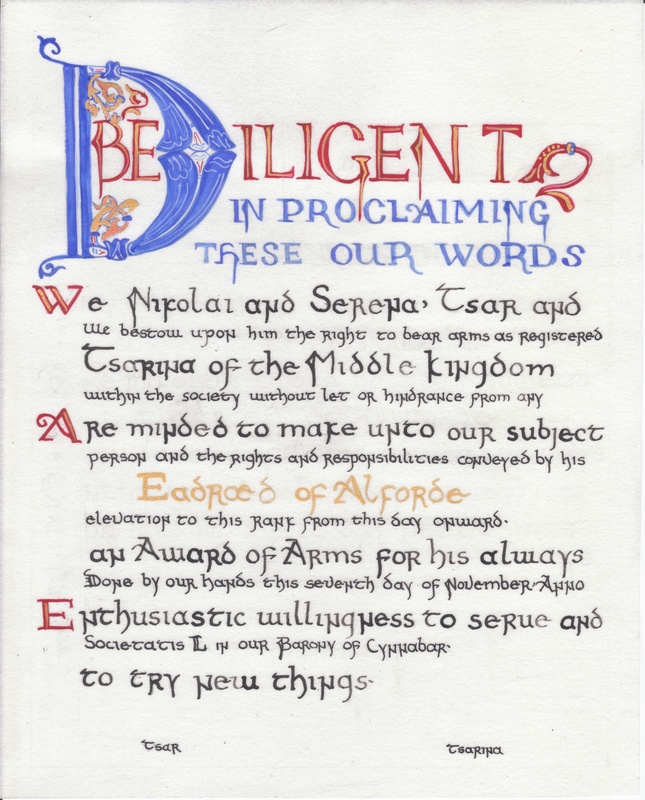 Those who were "tithed" to the church as children, had the time to learn to read and write as it was necessary to properly learn and study the Bible, the letters and writings of the church fathers, as well as the writings of your founder and leaders of your order. 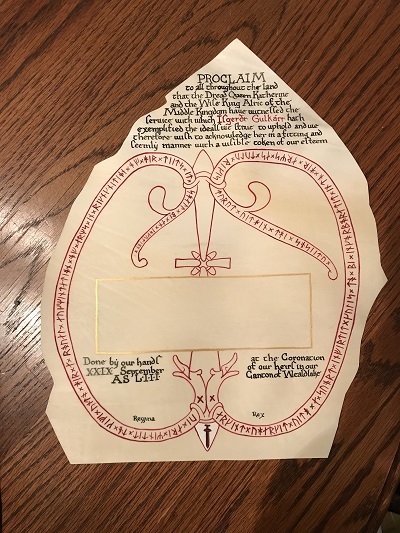 This was needed by the priests to properly administer the mass and other sacraments. 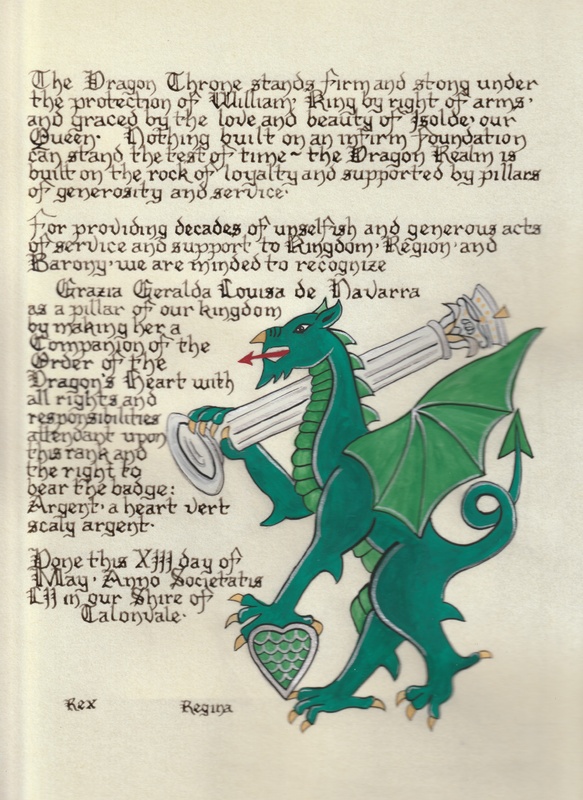 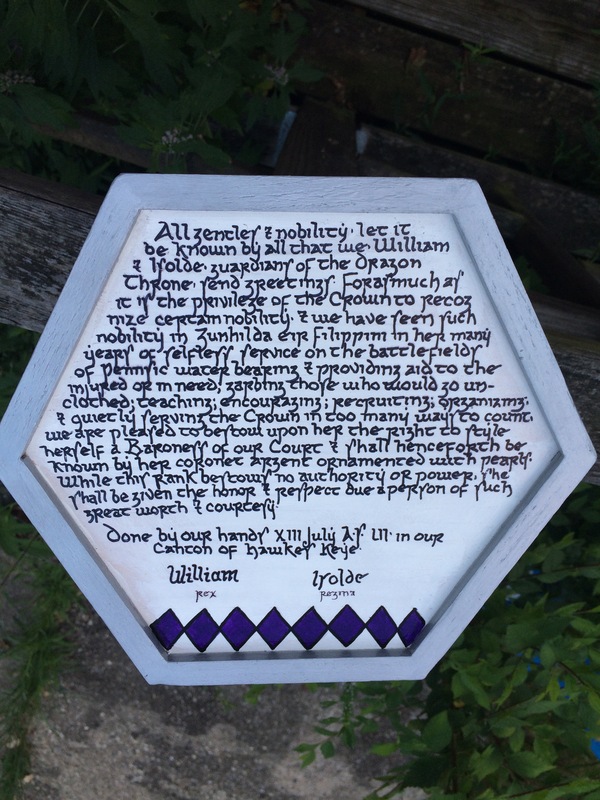 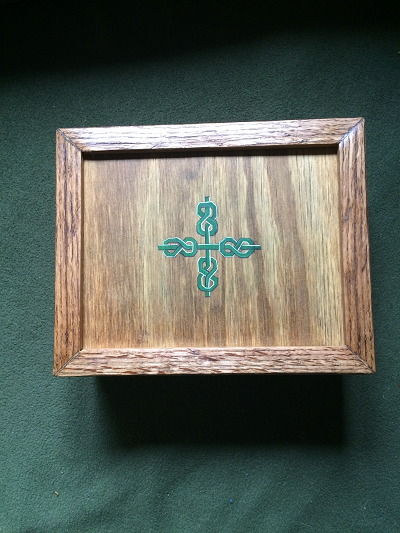 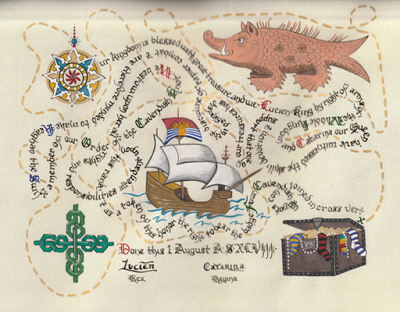 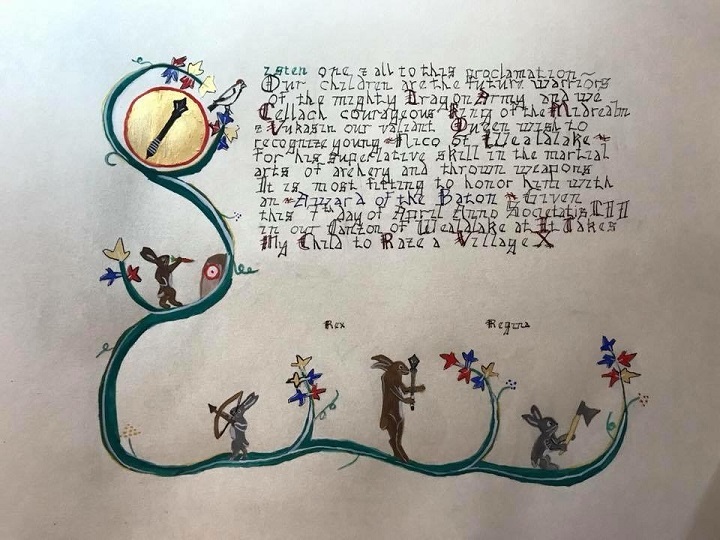 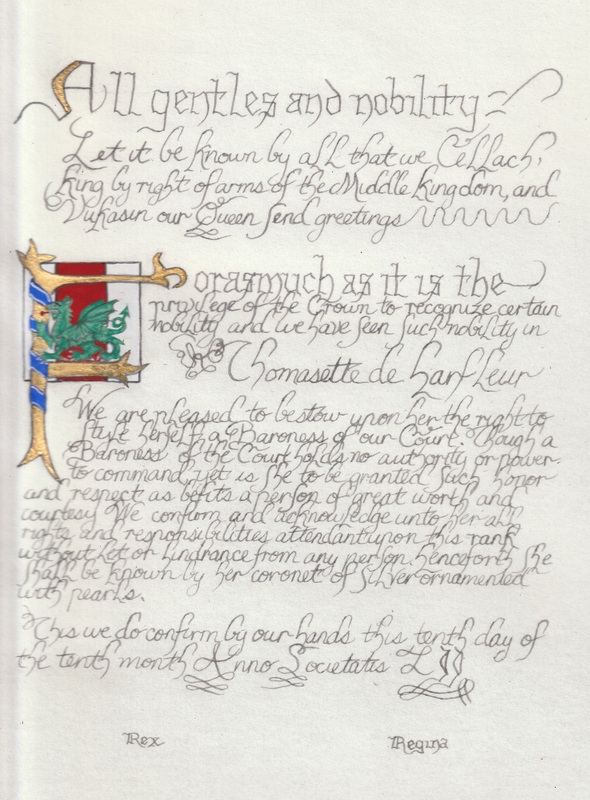 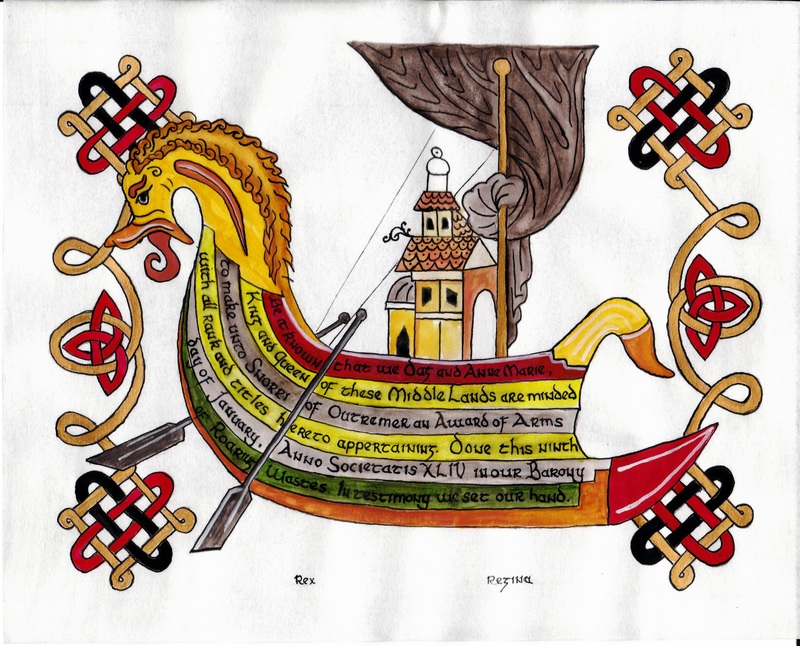 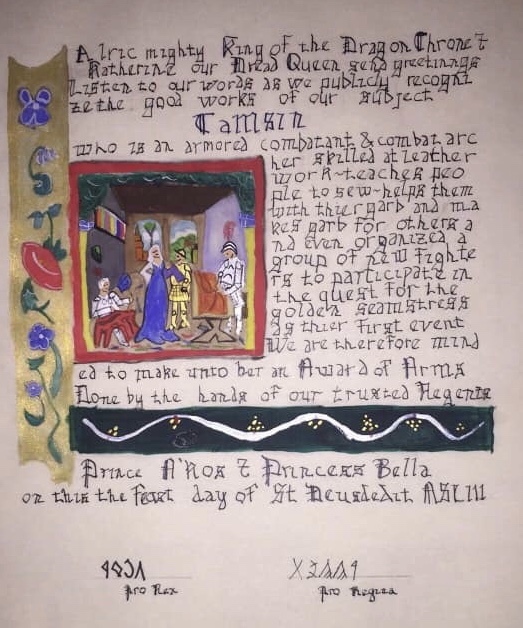 The nobilities' ability to read and write is evidenced by the correspondence we use as research today into the lives of the medieval time period, and by the Psalter and Book of Hours . This was a book that allowed the laymen to read the Psalm for the day and pray the appropriate prayers at the proper times of the day for meditation, penance, protection from evil, safety while traveling, blessing on their work, etc. 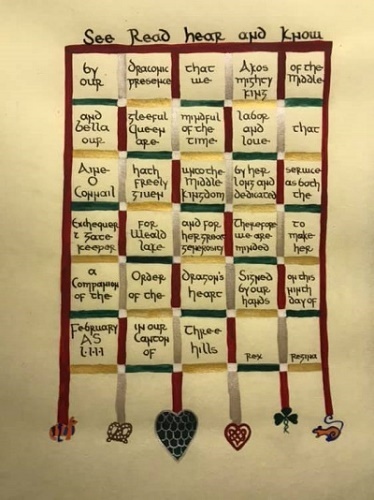 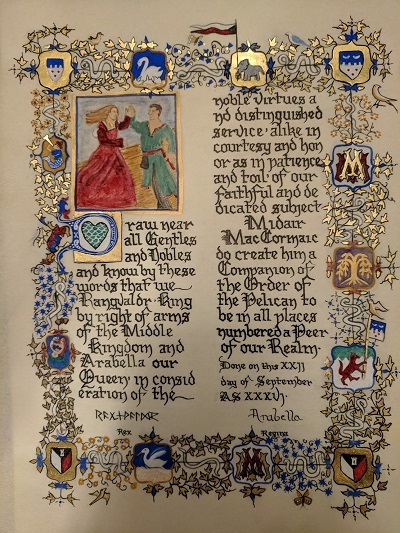 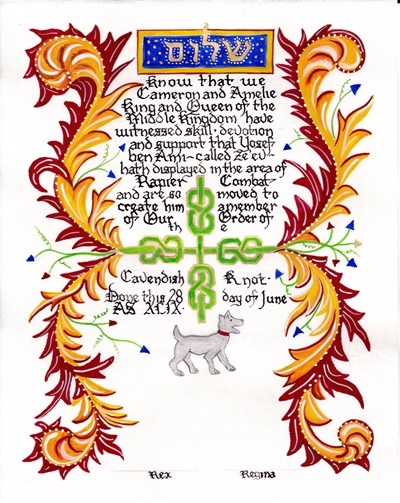 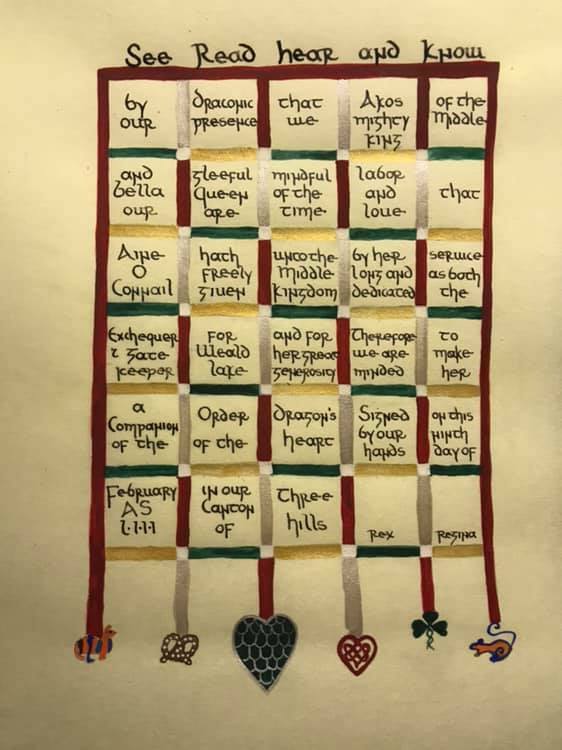 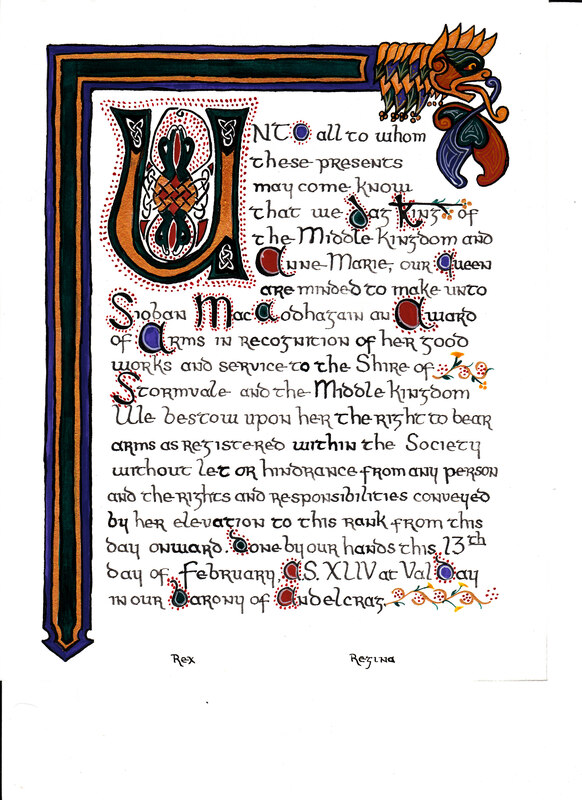 An illuminated manuscript is a manuscript in which the text is supplemented by the addition of decoration, such as decorated initials, borders and miniature illustrations. 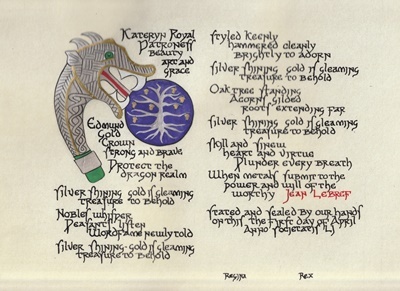 In the strictest definition of the term, an illuminated manuscript only refers to manuscripts decorated with gold or silver. 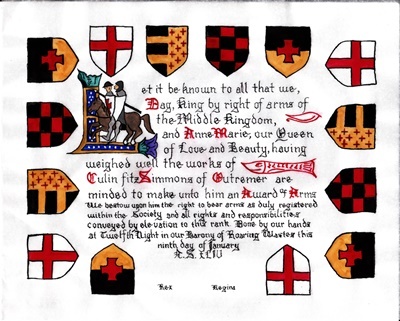 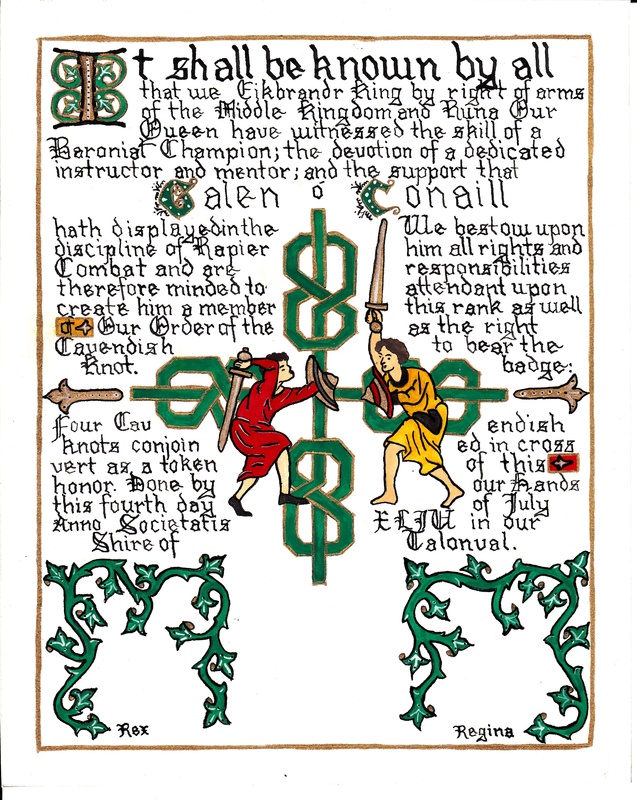 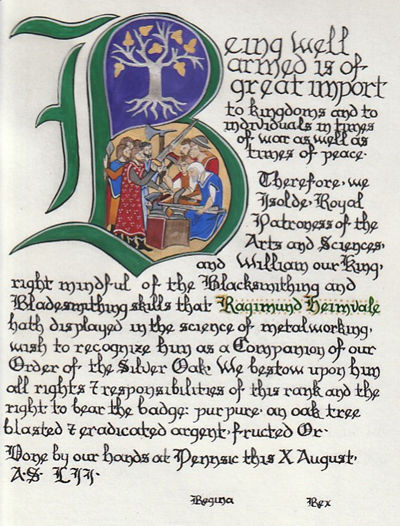 Most illuminations use the basic colors of heraldry - red, green, yellow/gold, blue, silver/white and black. 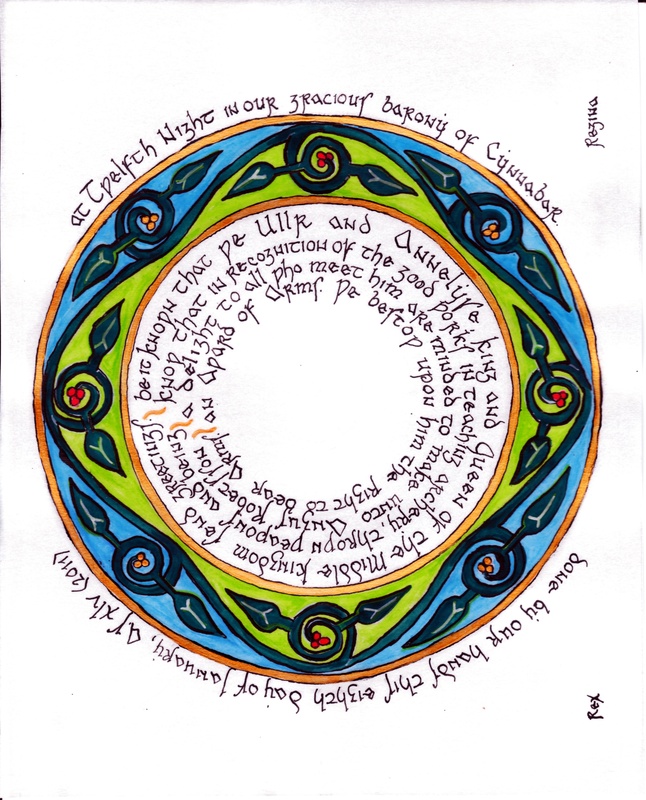 Calligraphy today is using traditional/contemporary alphabets or manuscripts to generate a work of letter art for an important document. 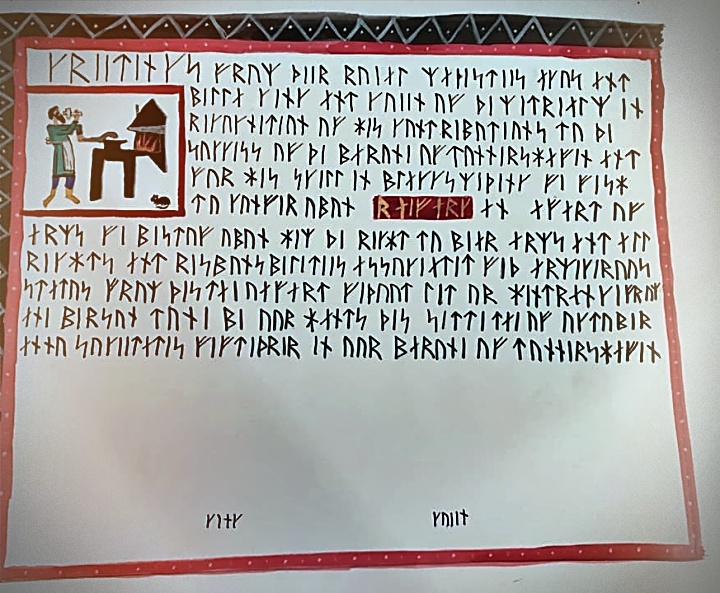 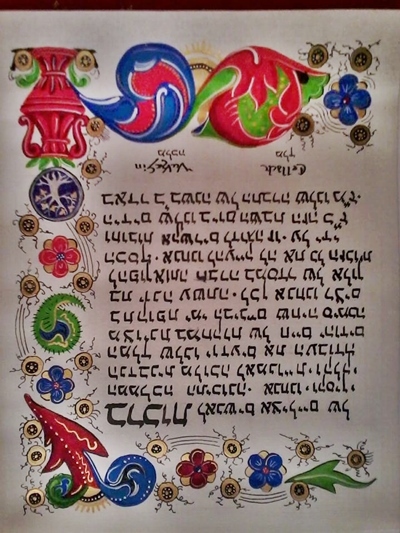 Altho there are computer alphabets that replicate the traditional alphabets, these are generally done by hand. 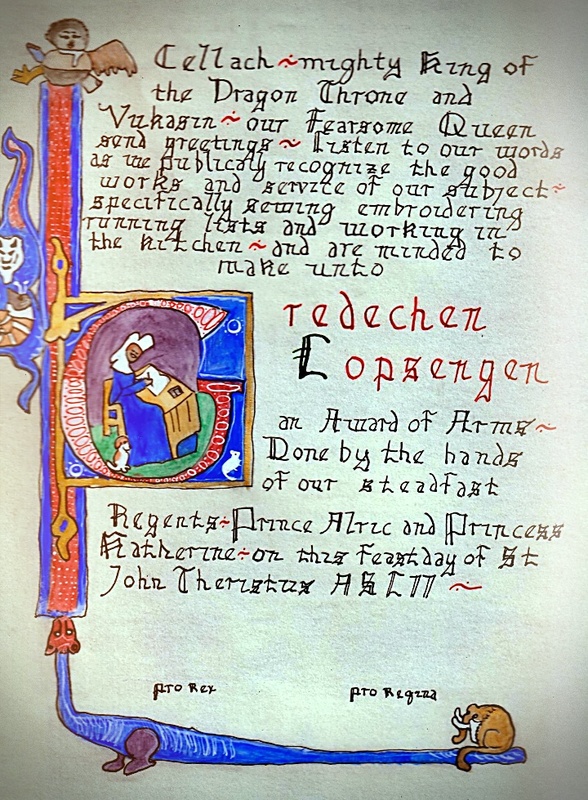 There are many books and articles online about the manuscripts for different time periods and cultures. 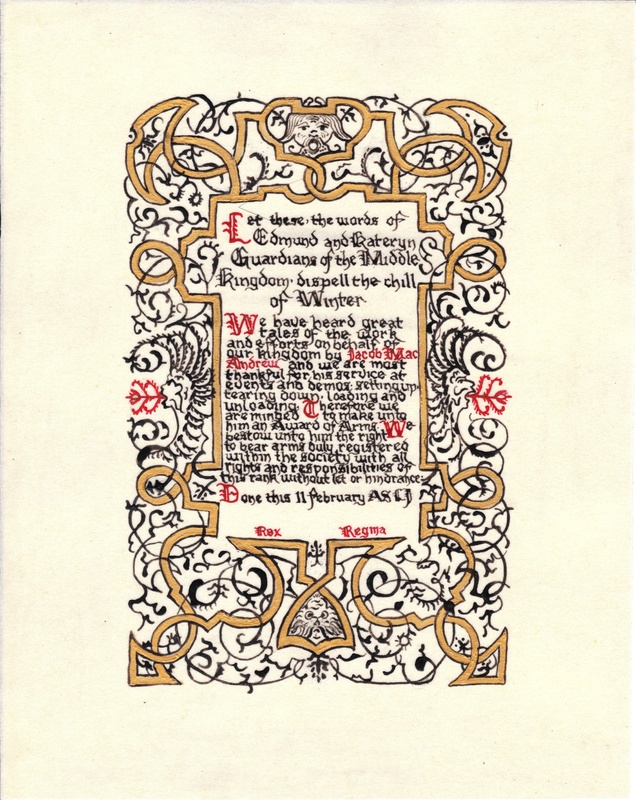 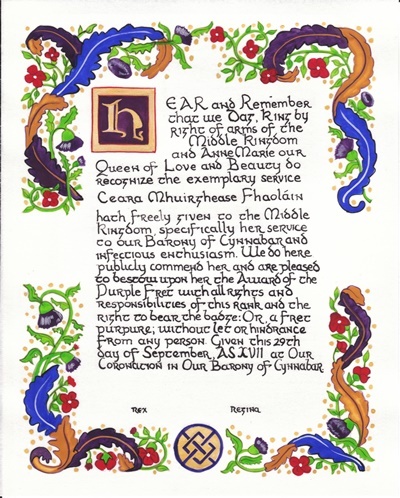 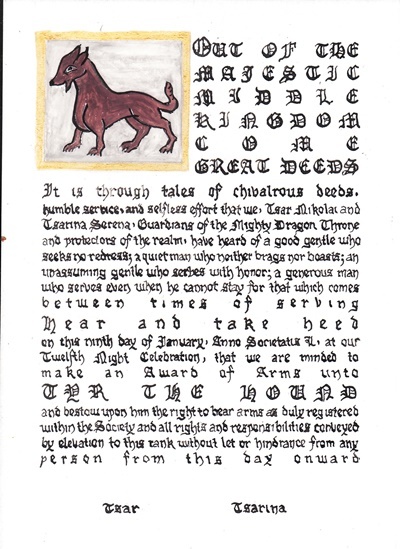 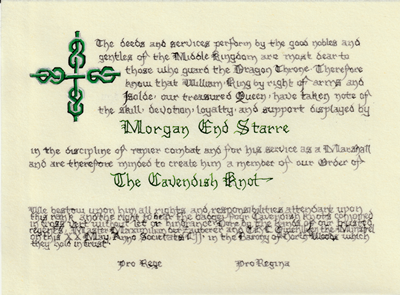 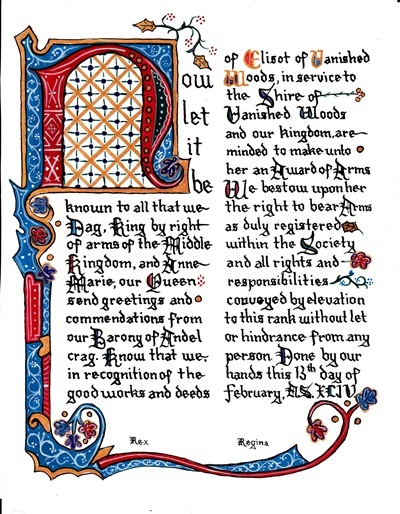 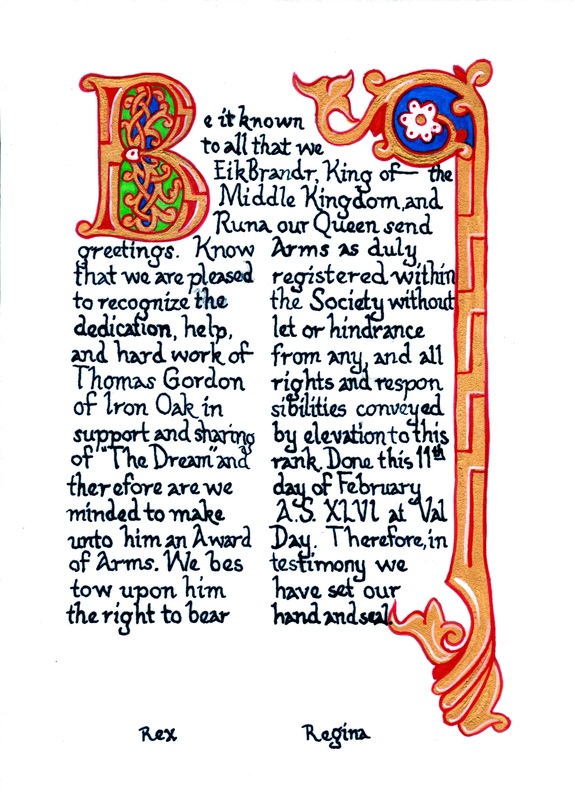 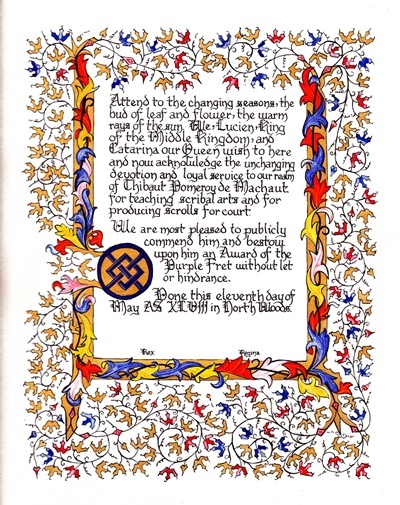 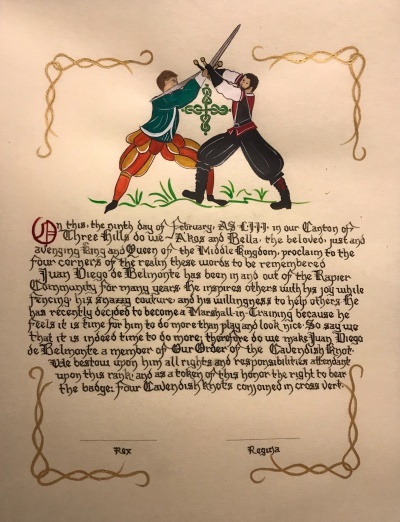 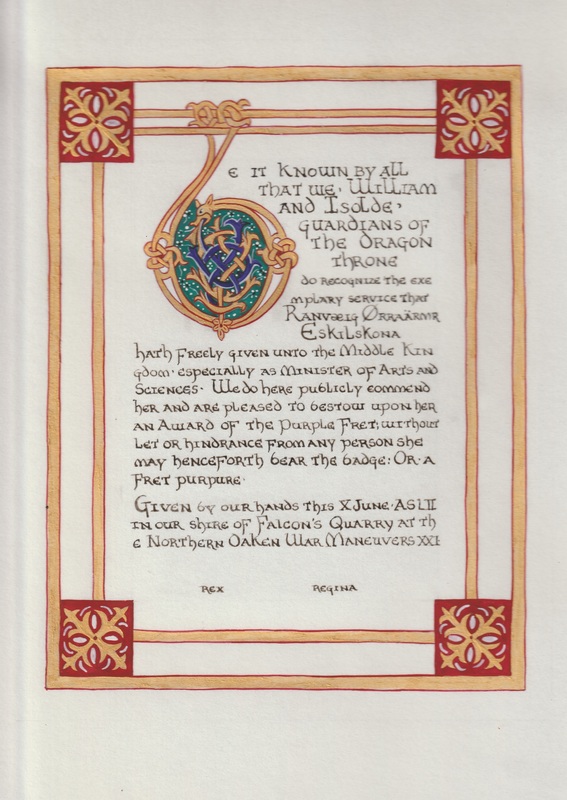 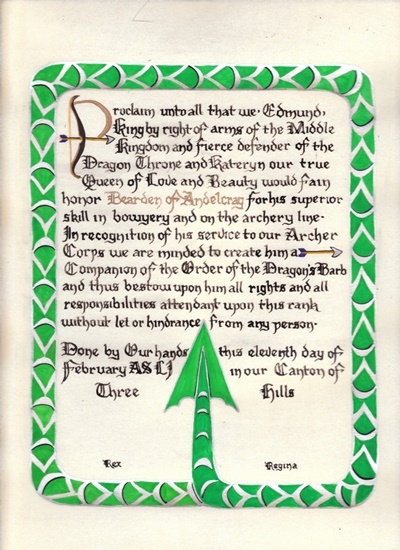 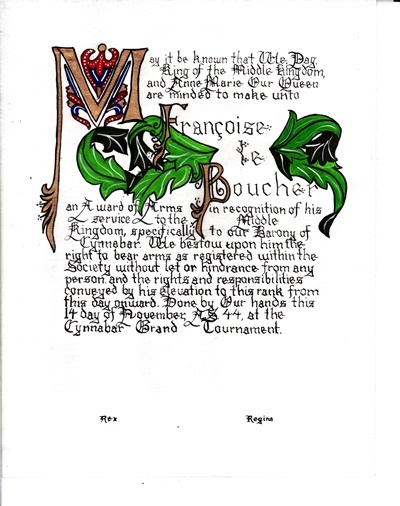 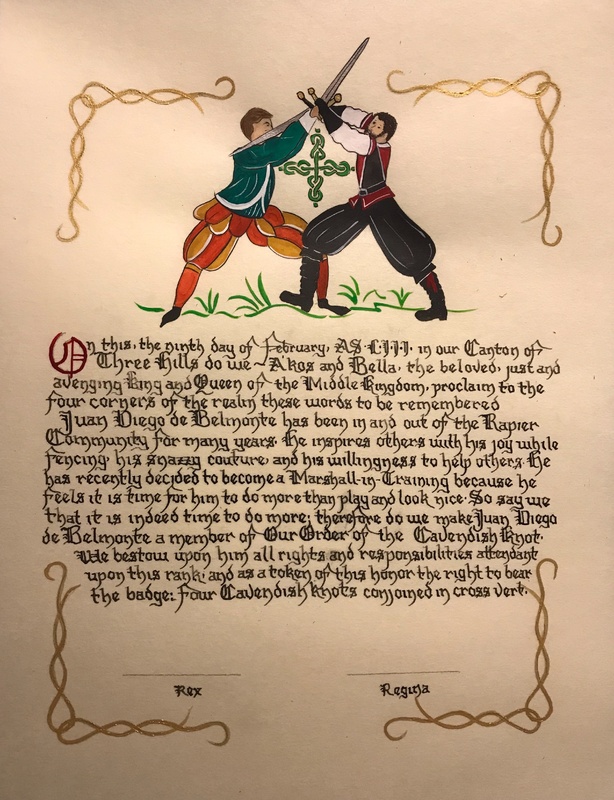 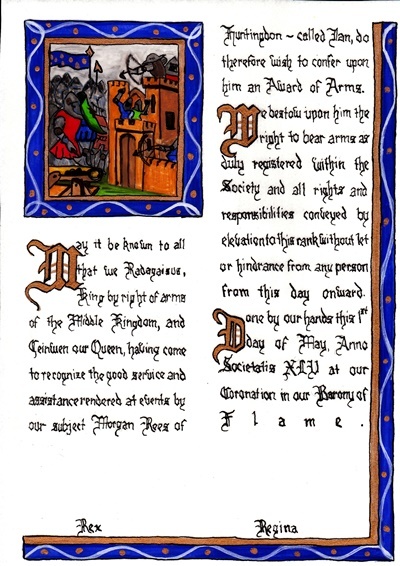 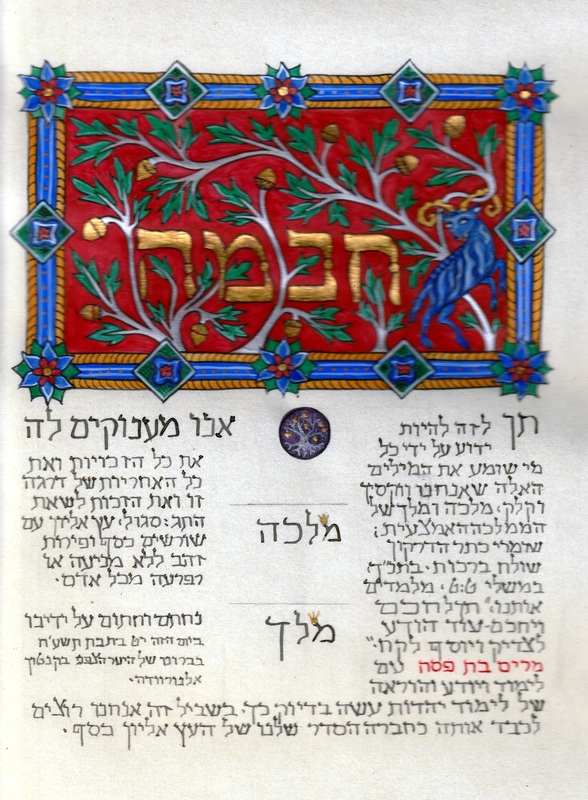 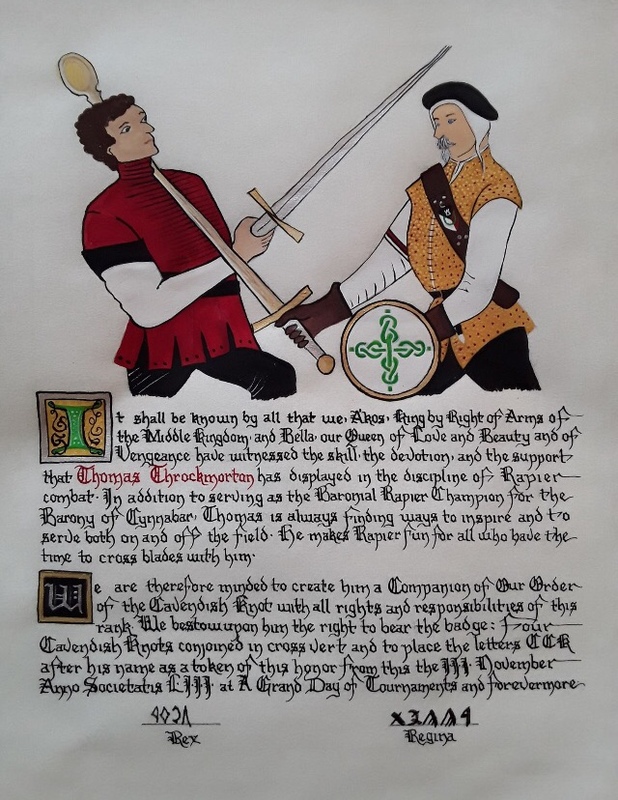 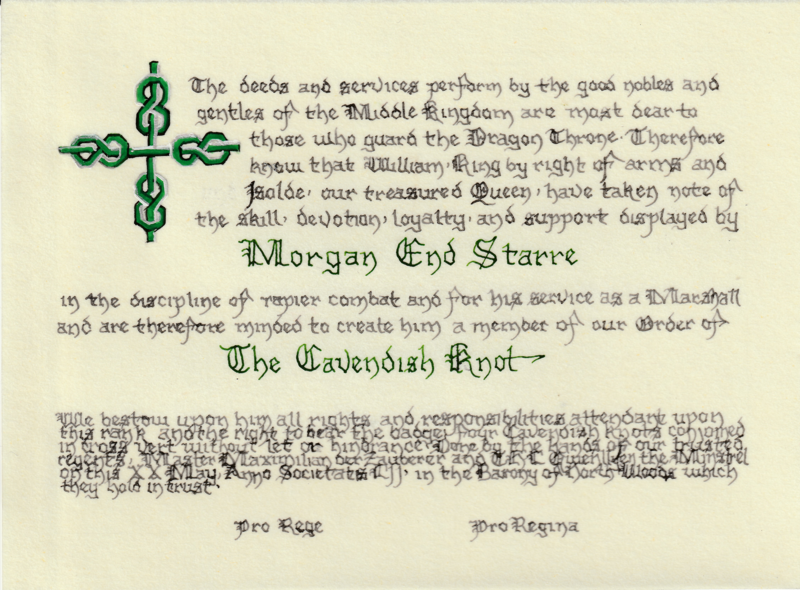 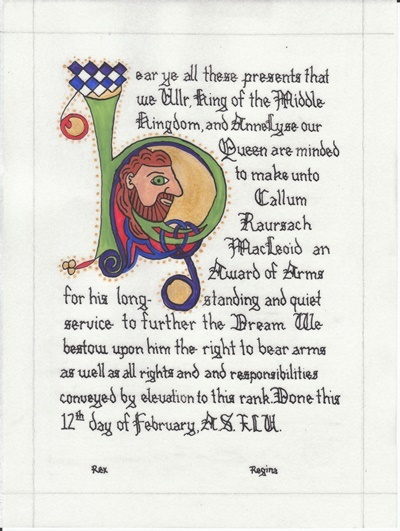 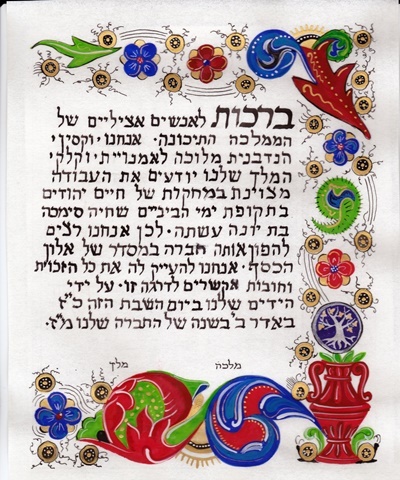 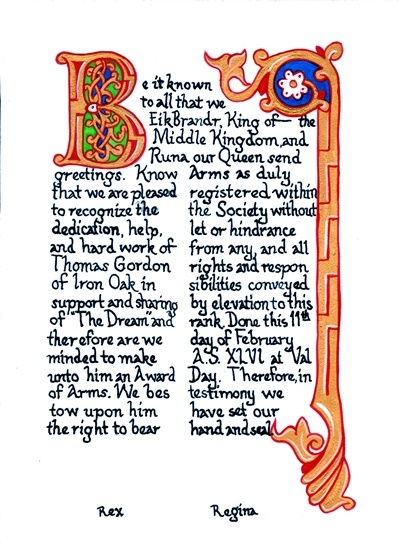 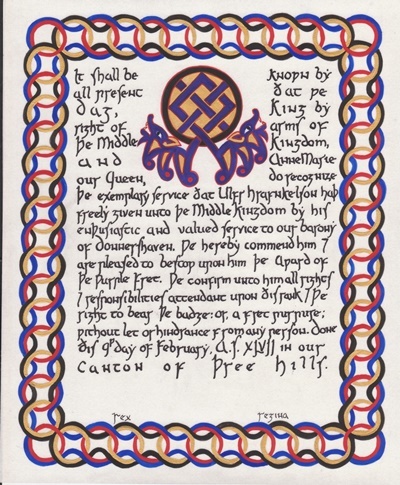 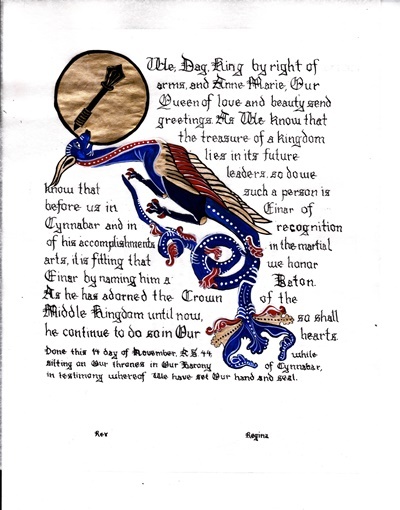 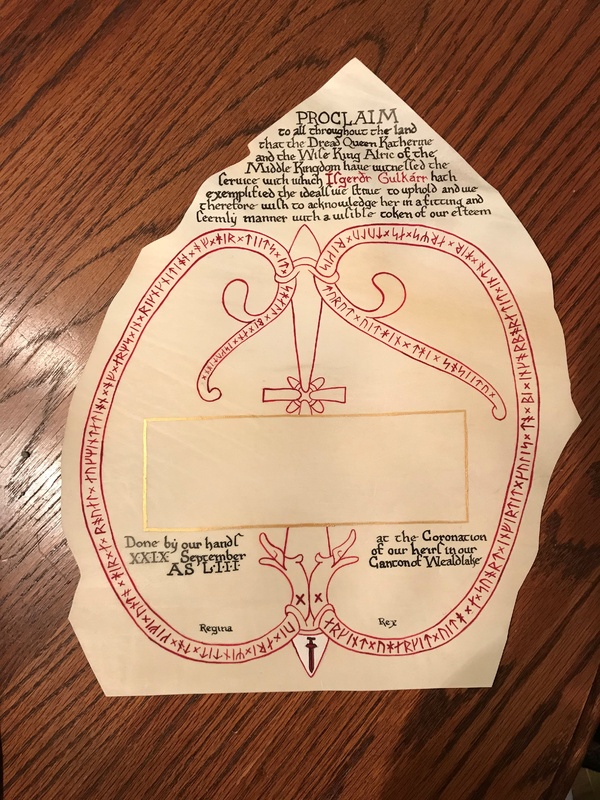 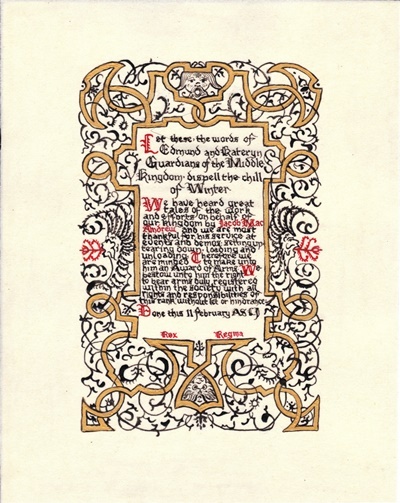 The tradition of using illumination and hand written documents continues today in special documents such as in the forms of wedding and event invitations, font design/ typography, original hand-lettered logo design, religious art, various announcements/ graphic design/ commissioned calligraphic art, cut stone inscriptions and memorial documents. 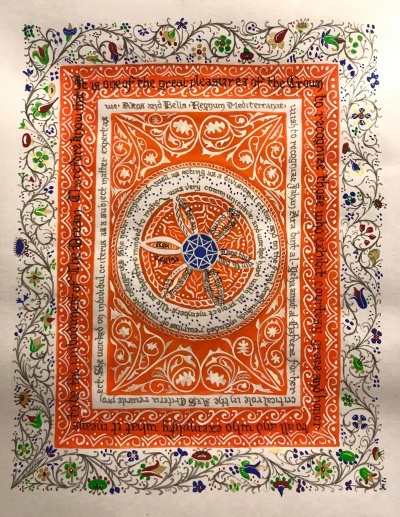 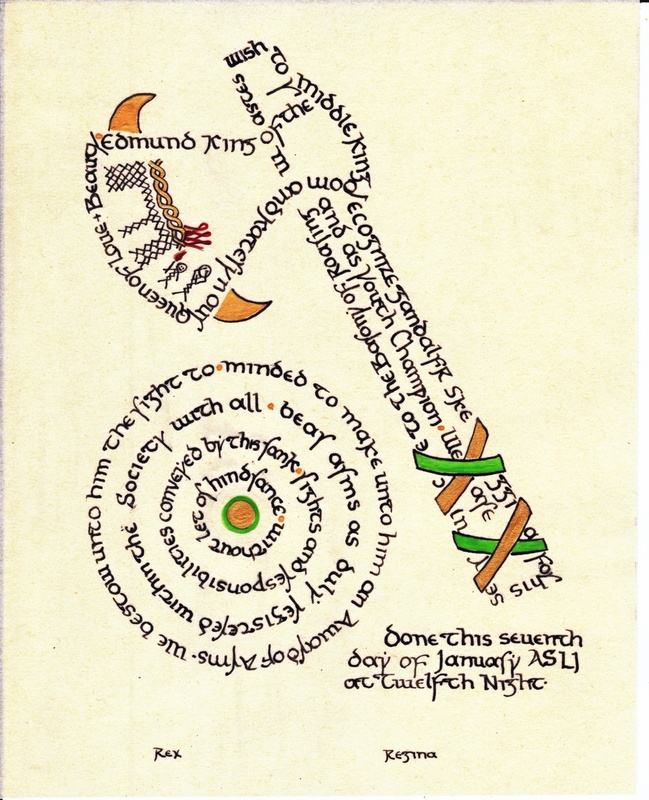 (See http://www.saintjohnsbible.org/ for a modern illuminated hand written Bible in process.) 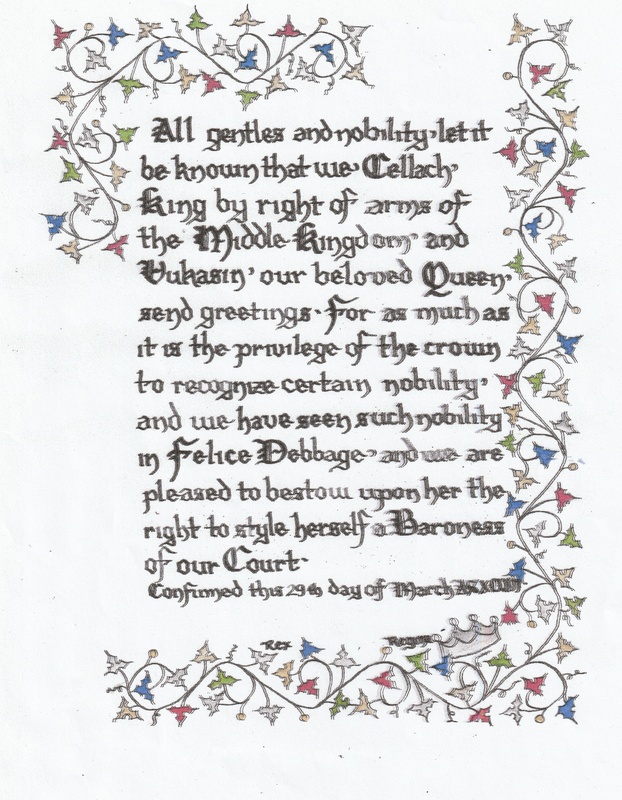 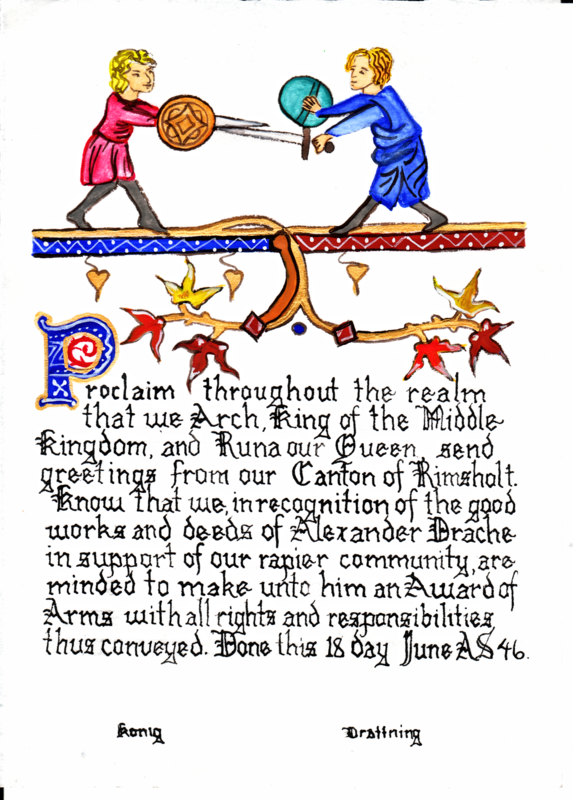 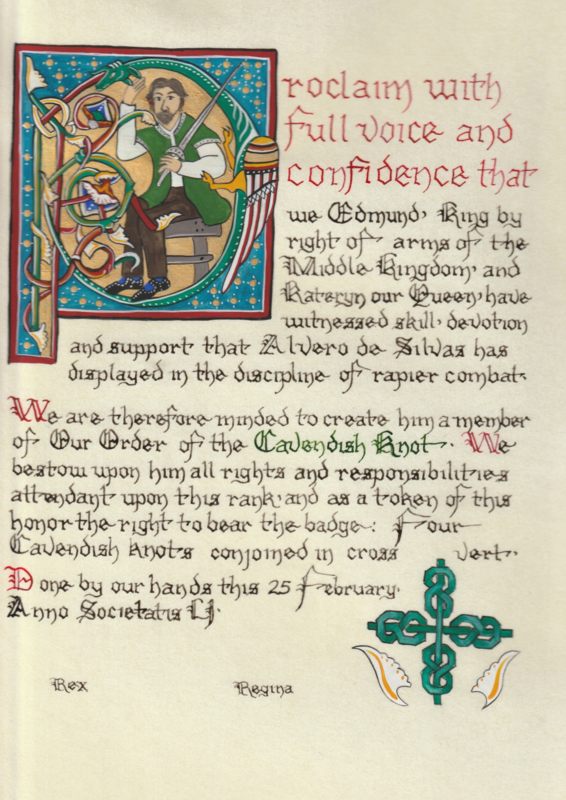 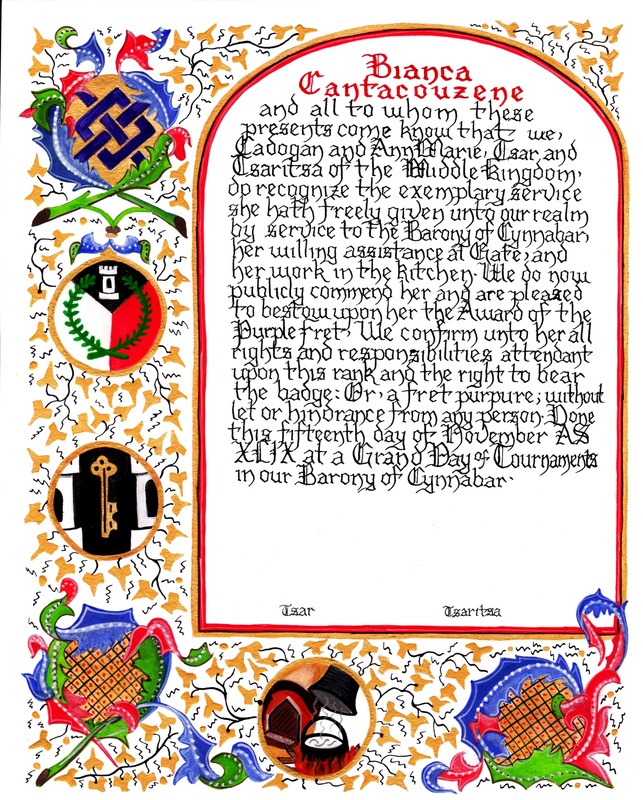 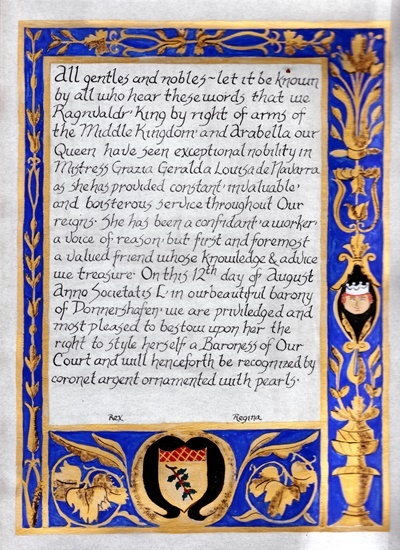 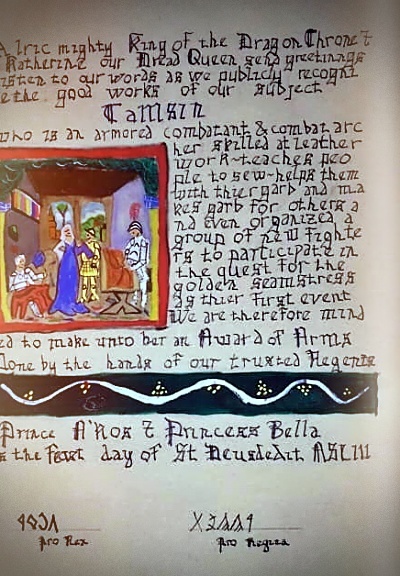 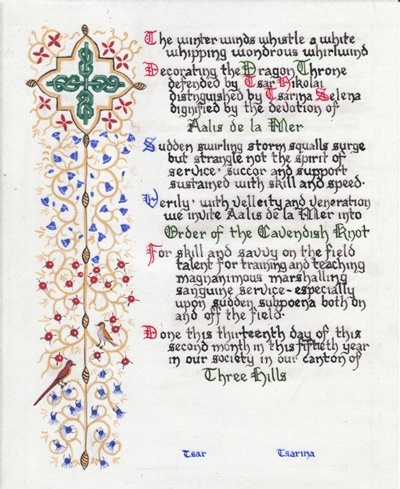 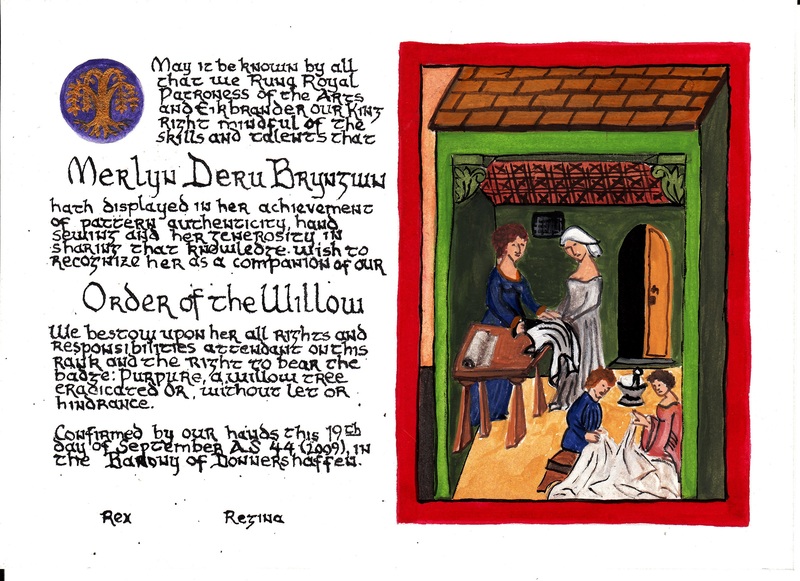 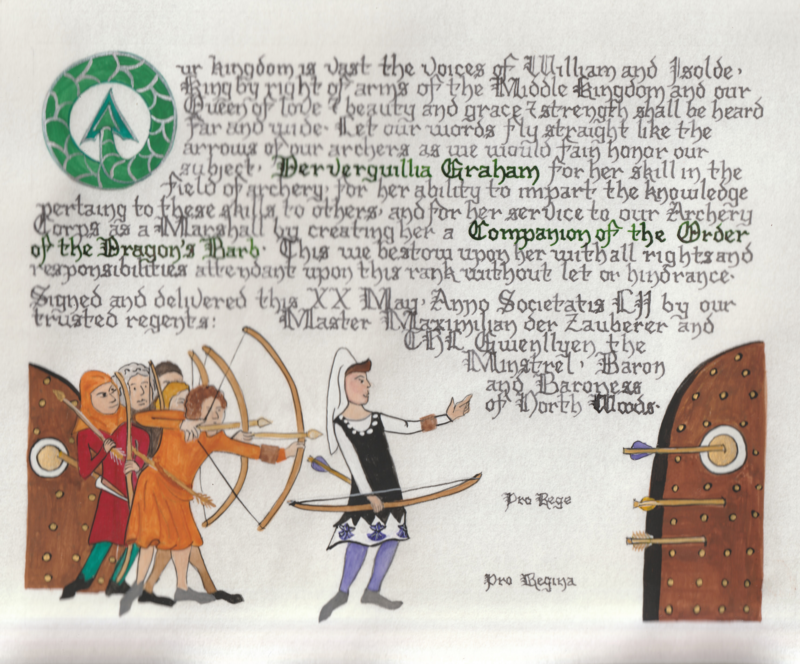 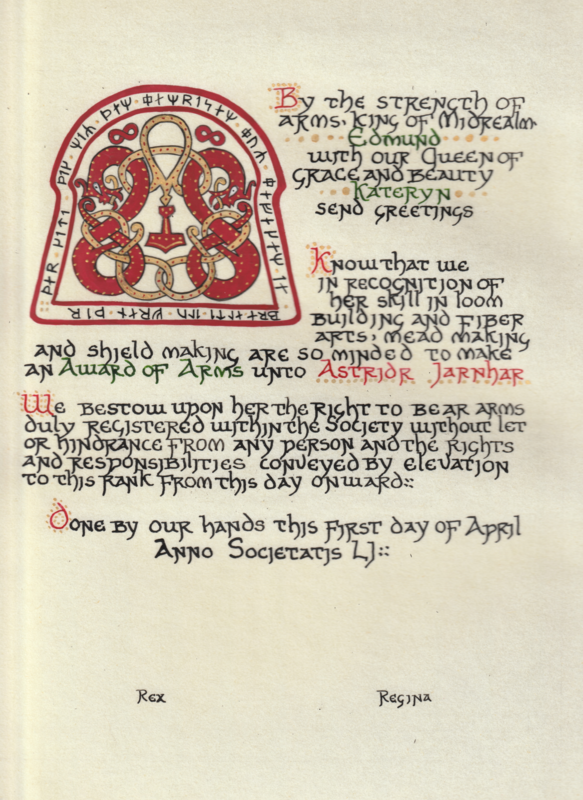 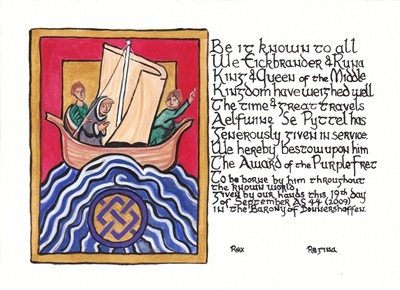 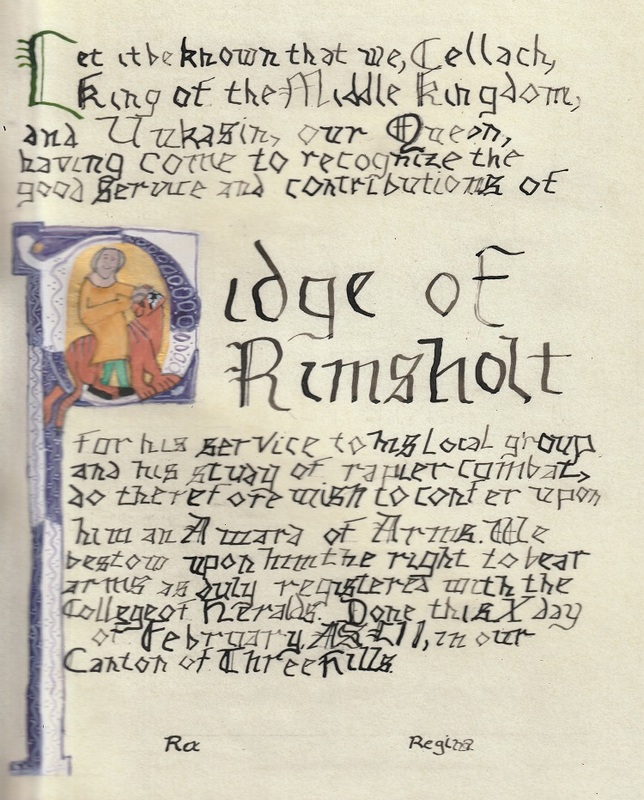 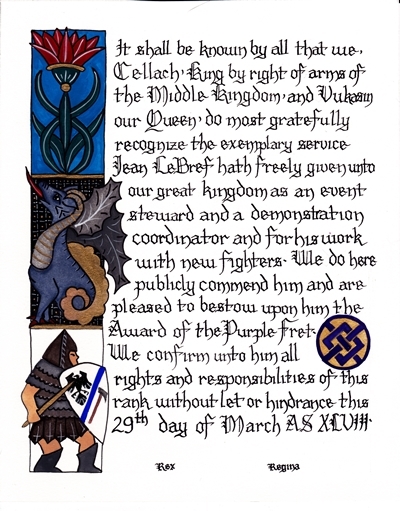 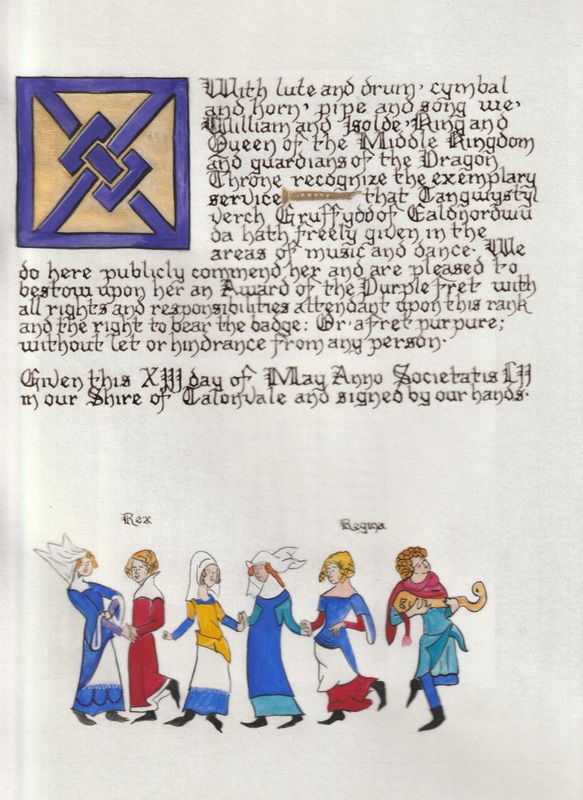 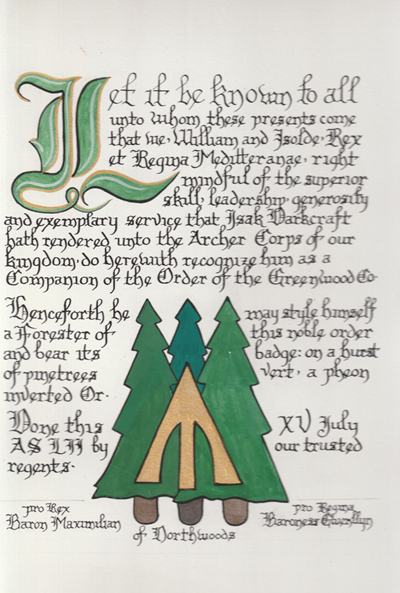 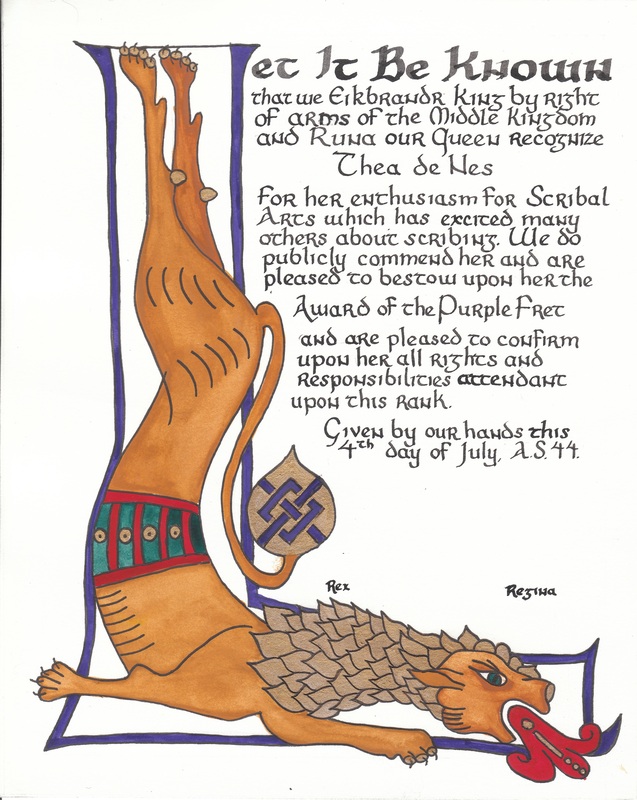 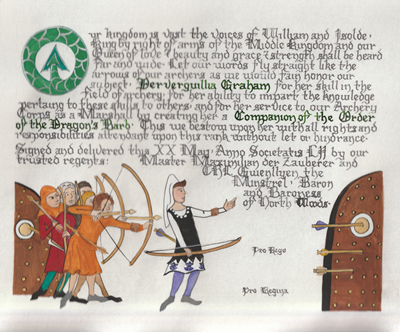 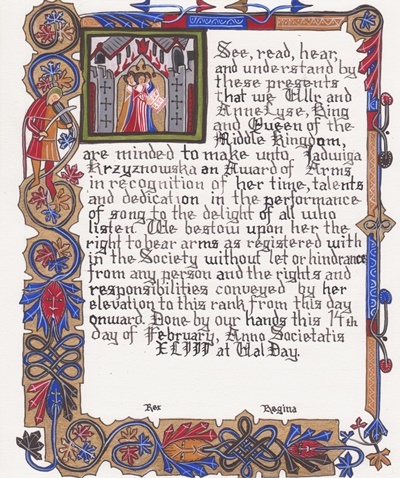 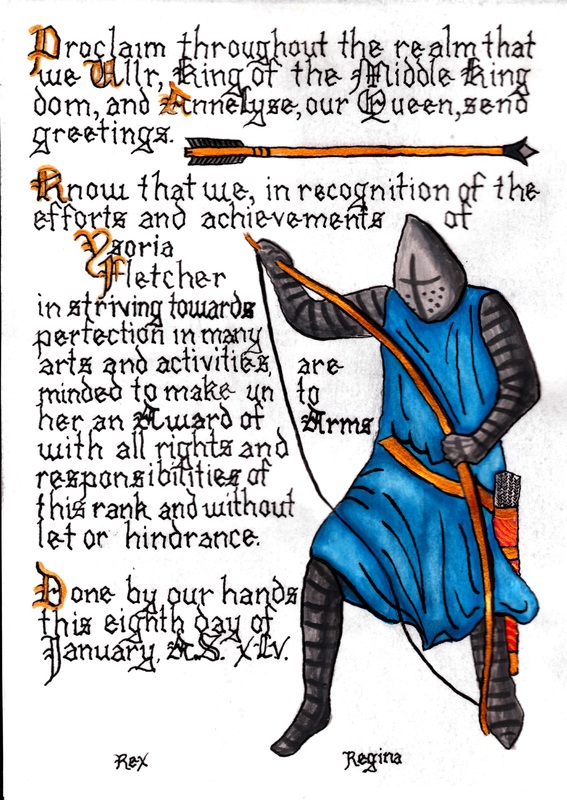 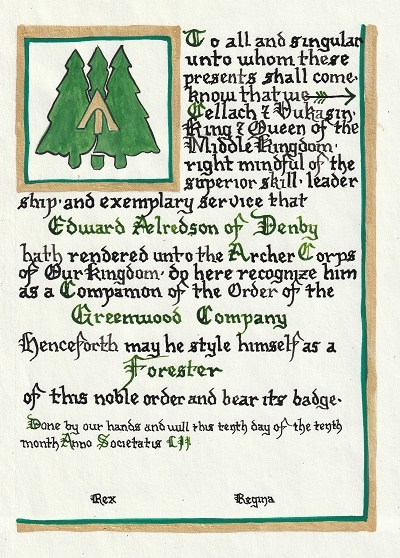 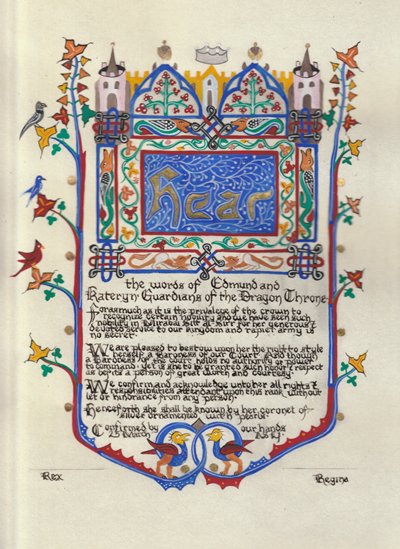 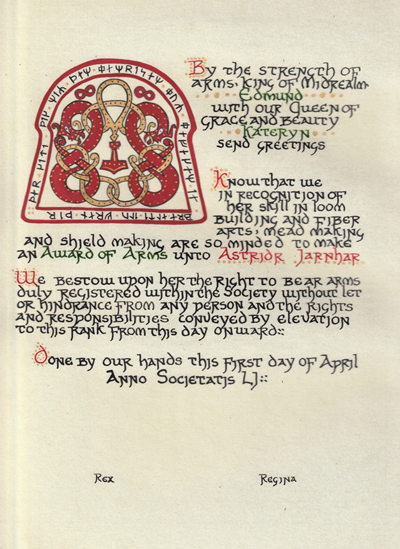 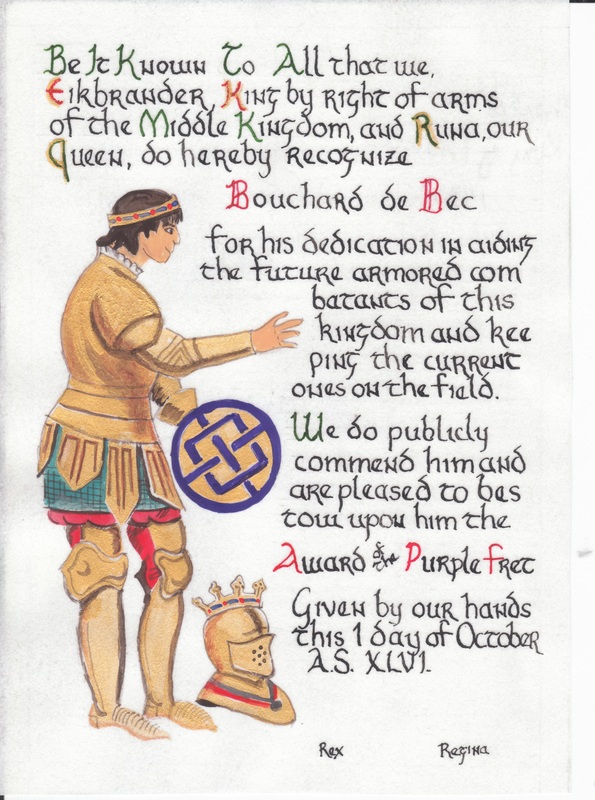 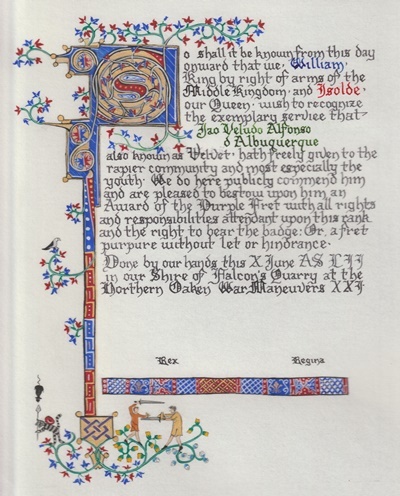 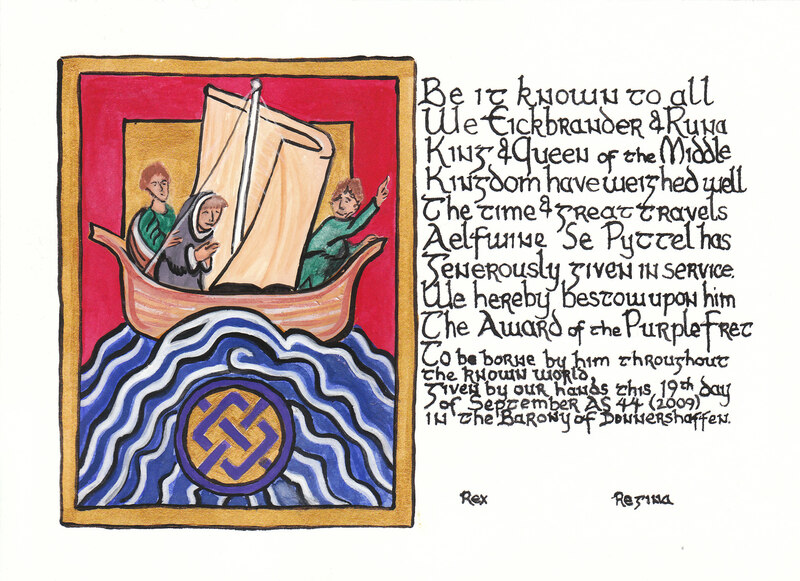 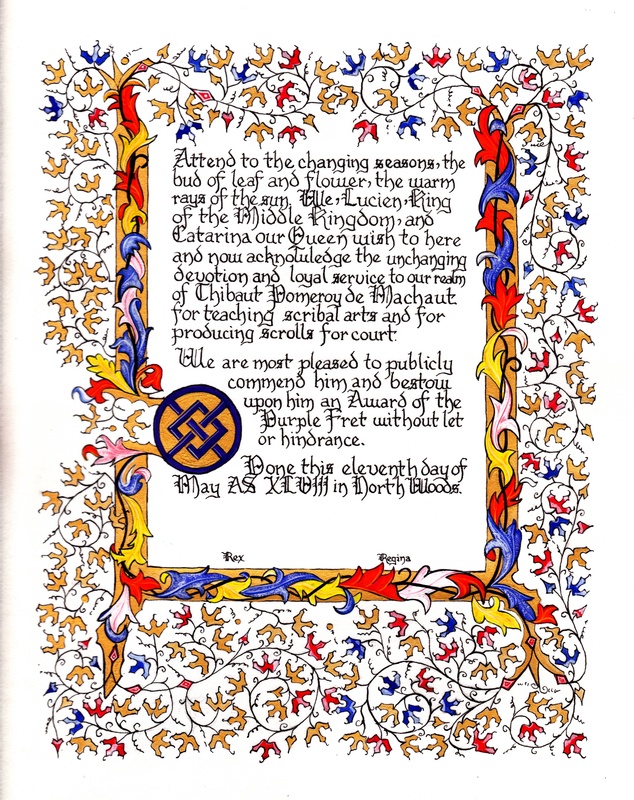 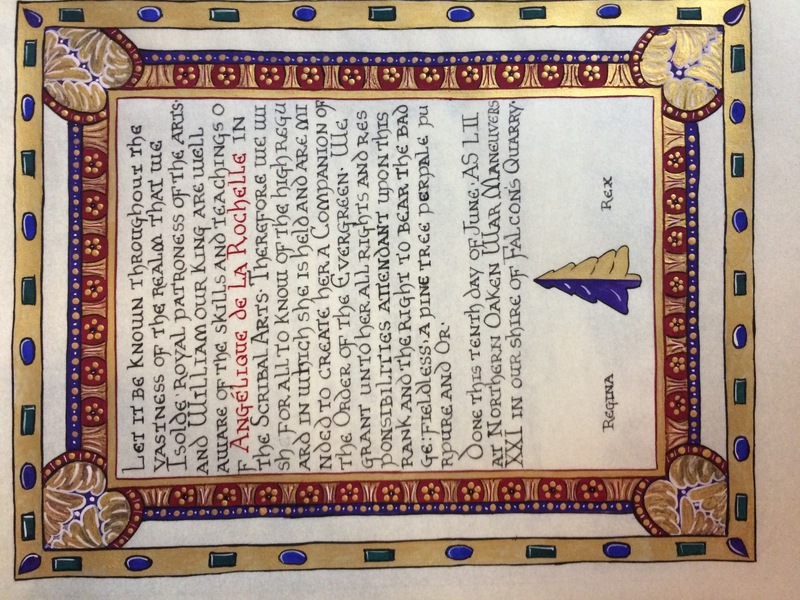 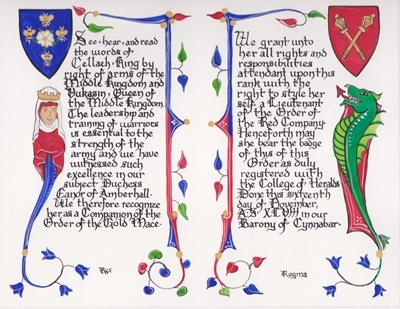 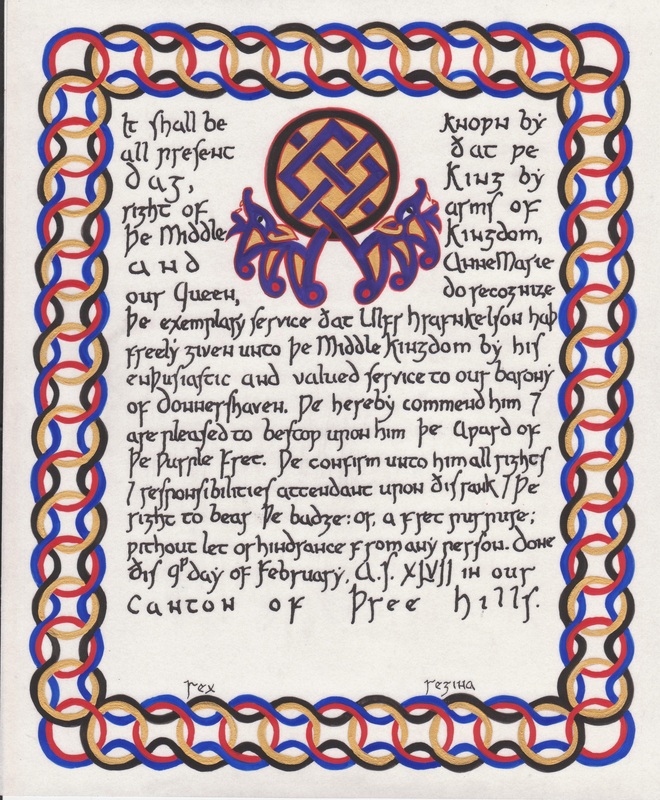 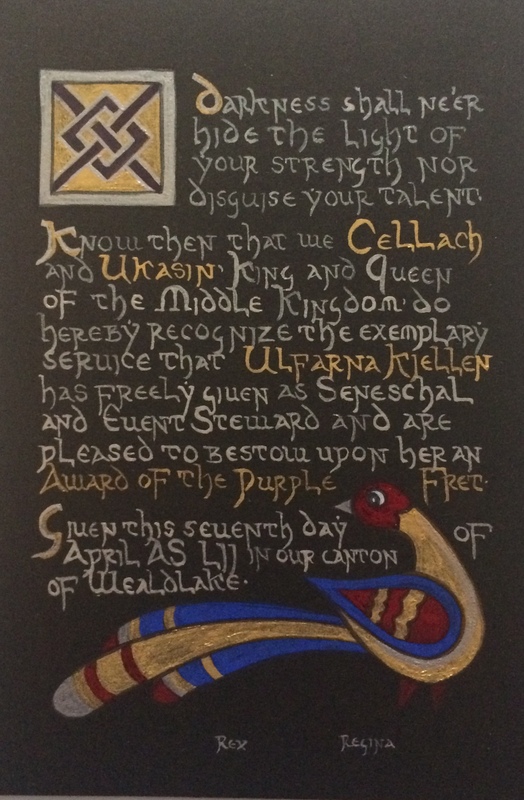 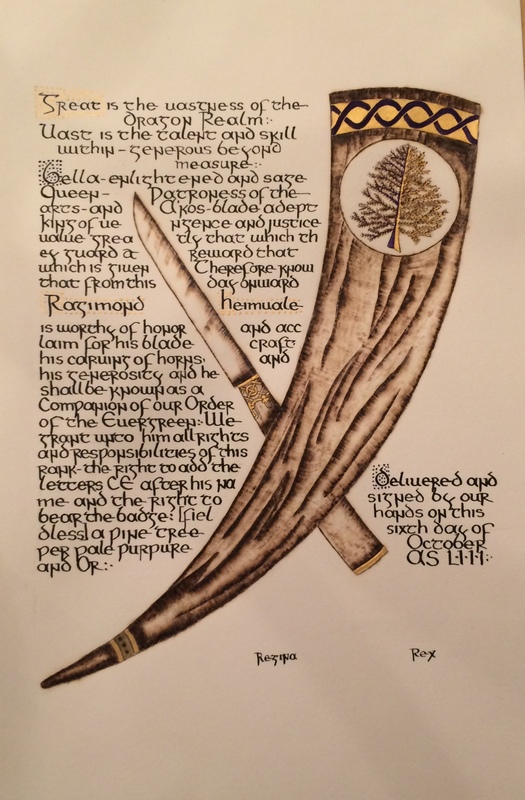 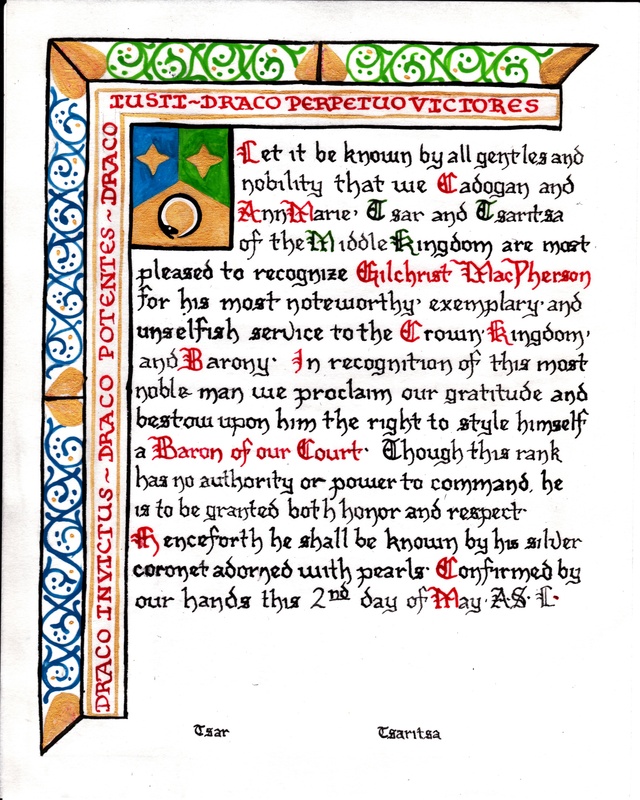 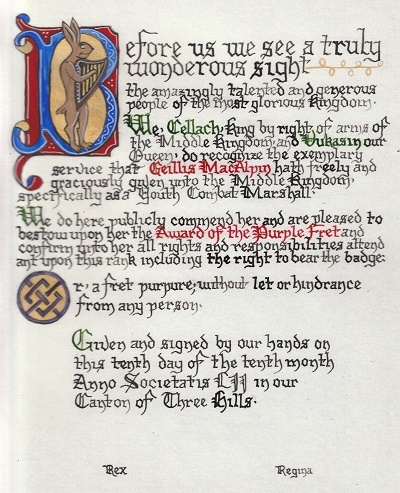 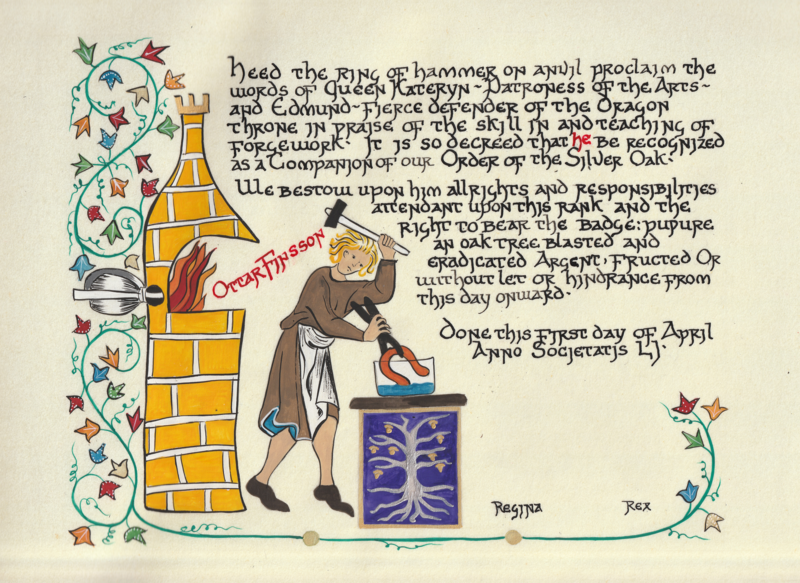 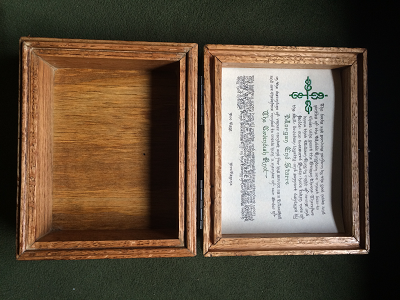 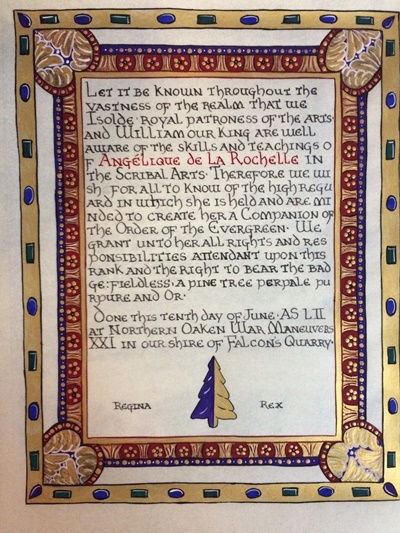 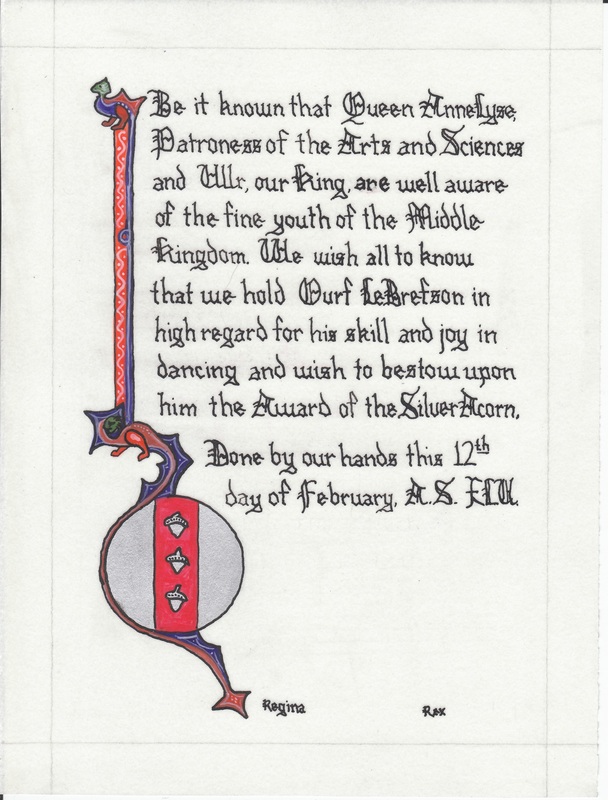 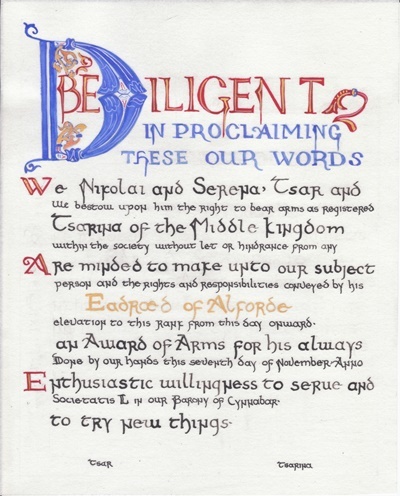 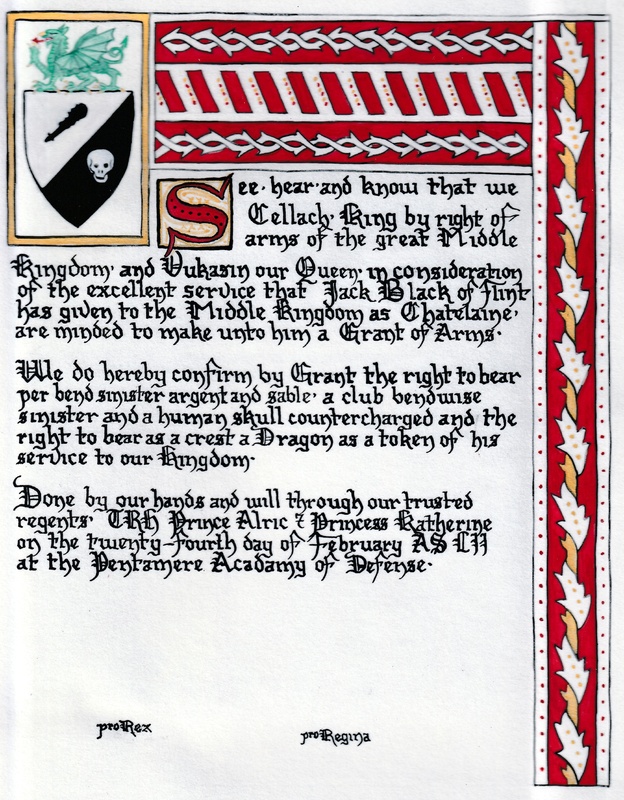 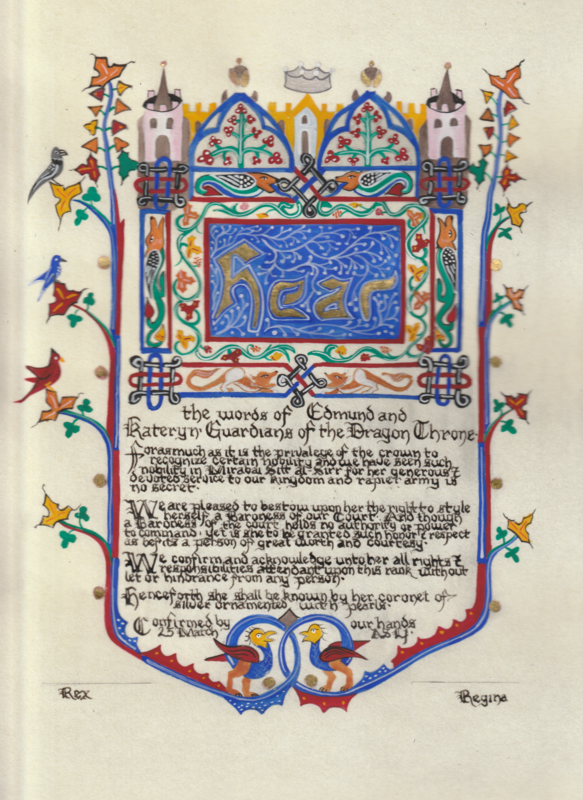 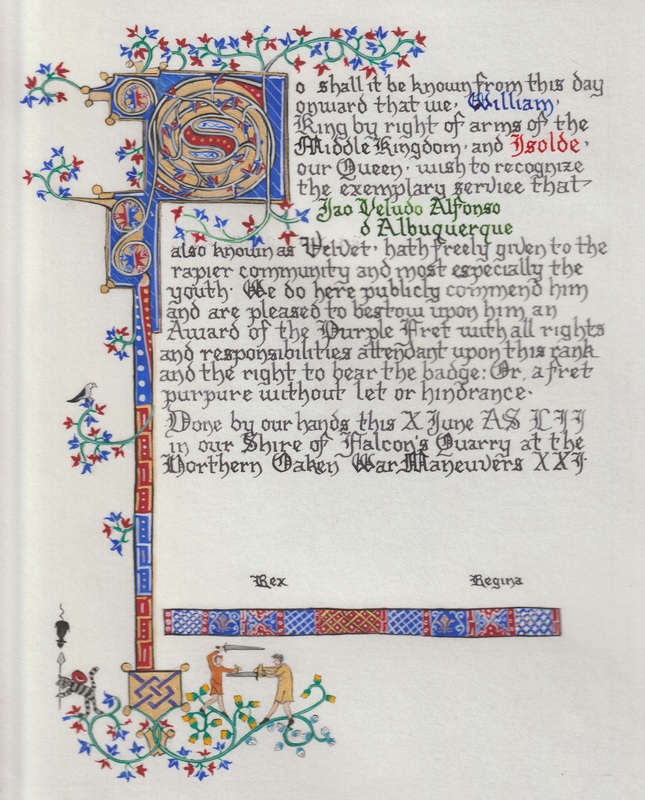 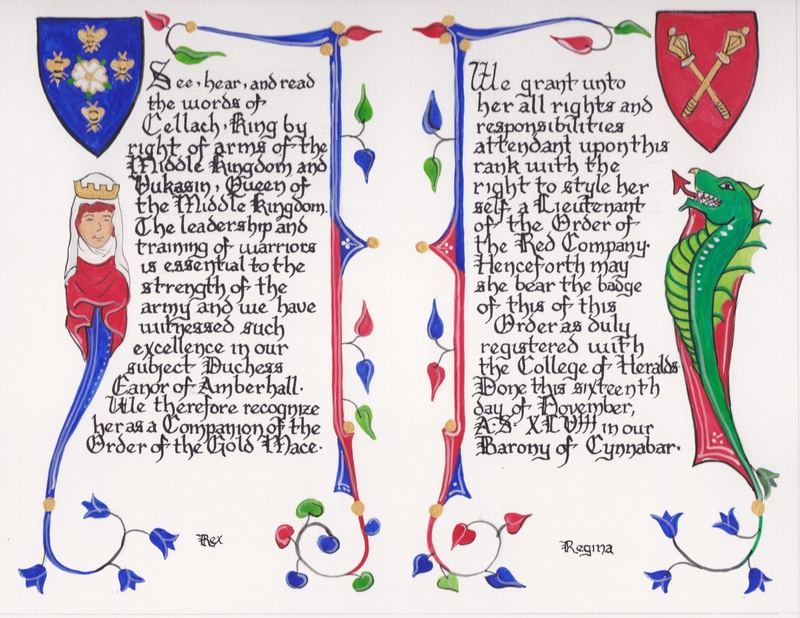 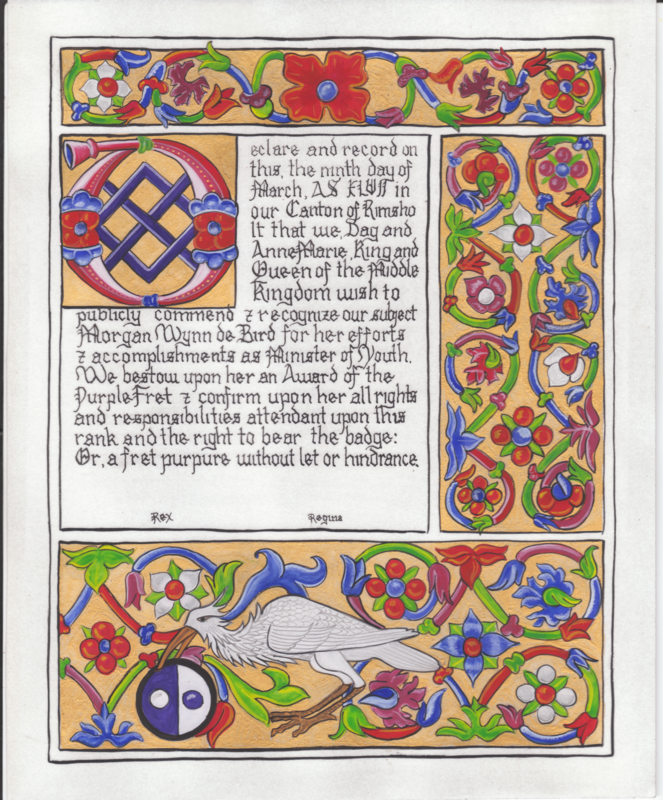 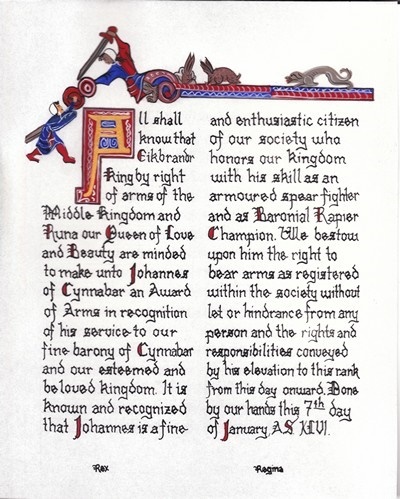 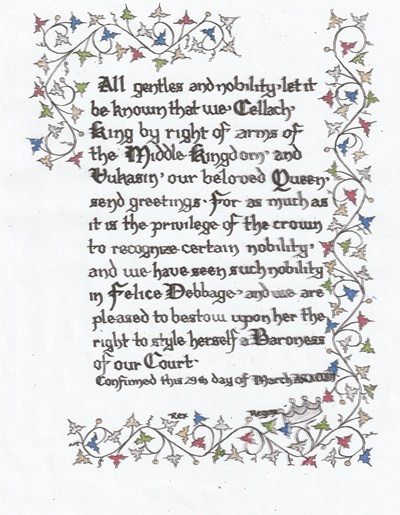 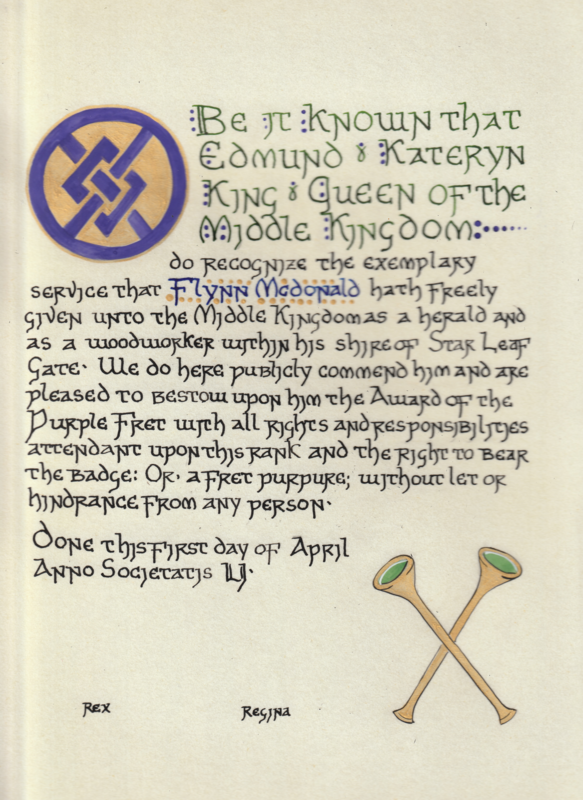 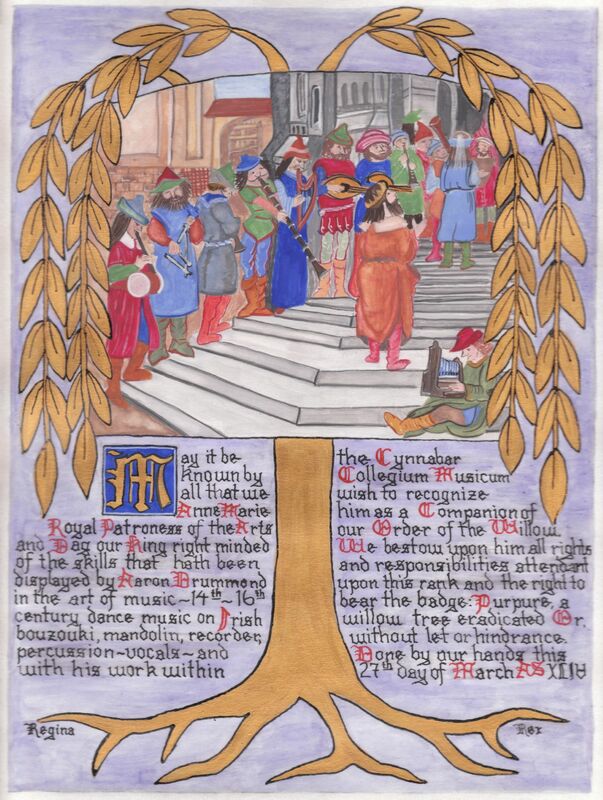 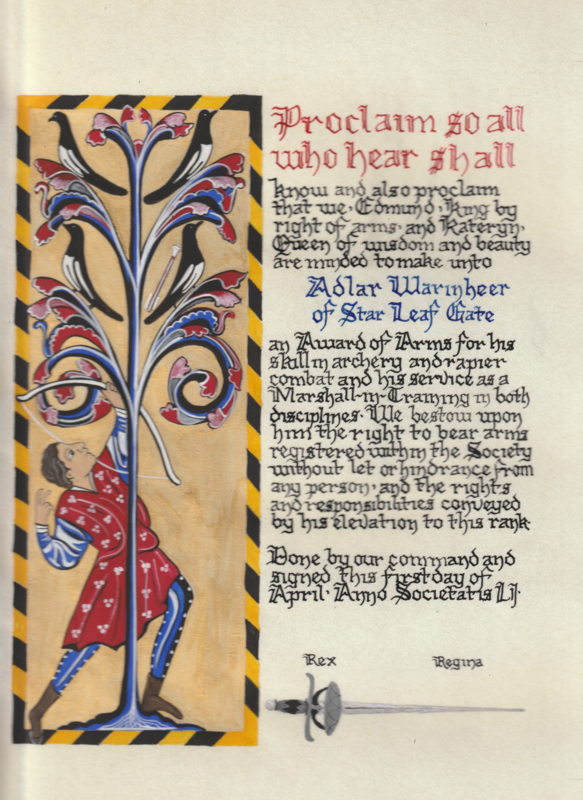 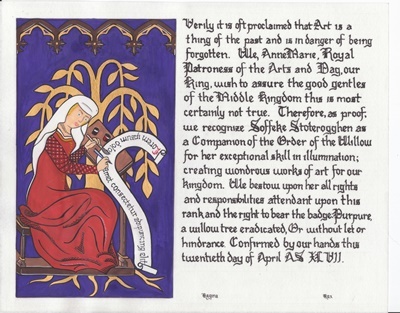 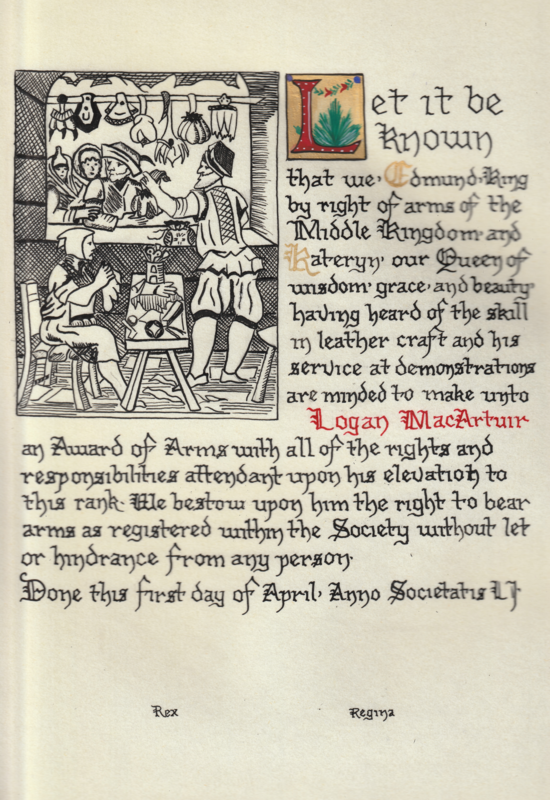 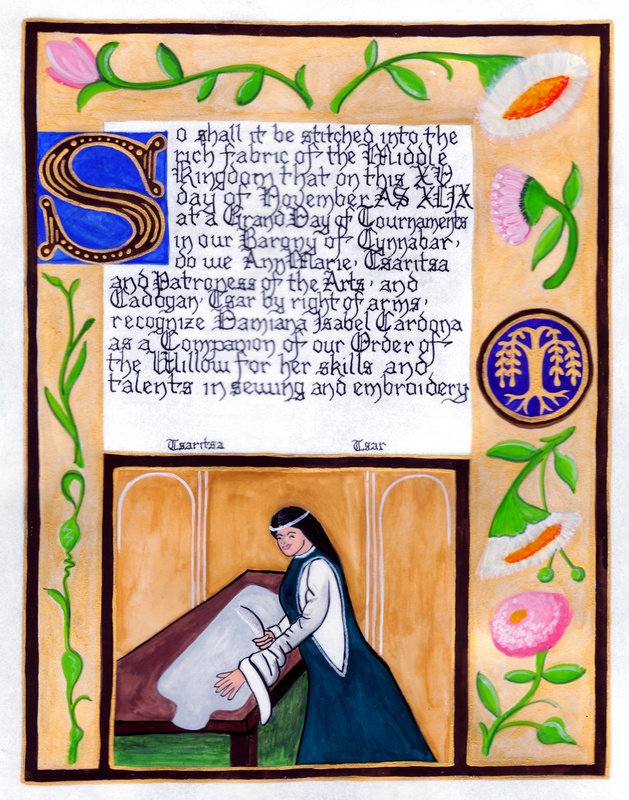 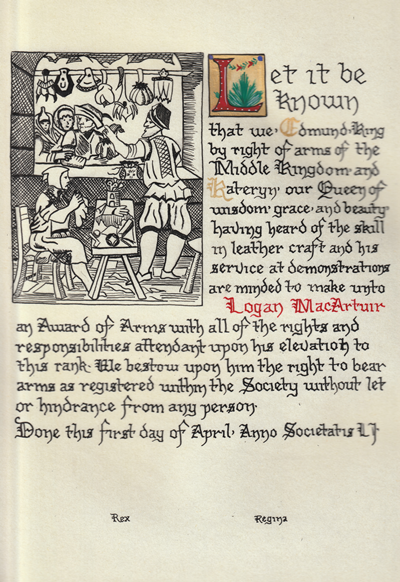 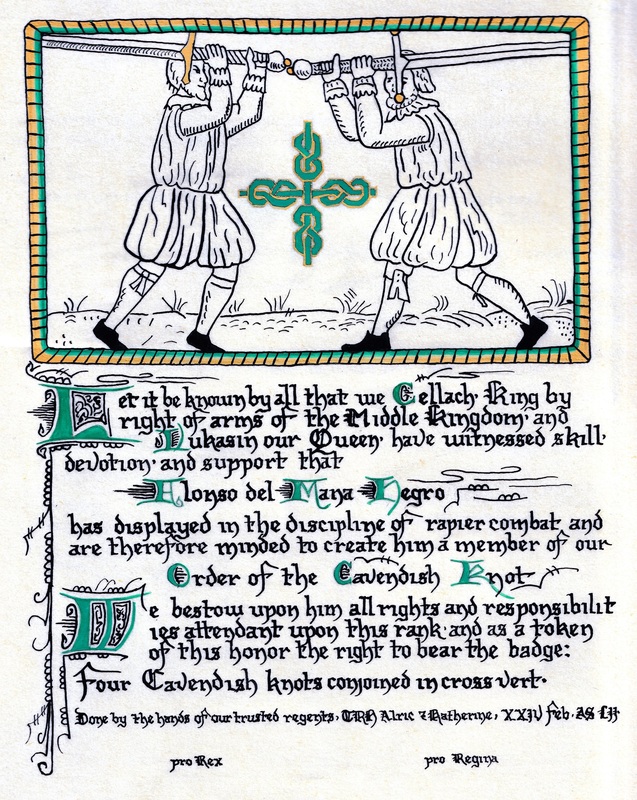 The SCA continues this tradition in the use of illuminated manuscripts for their awards. 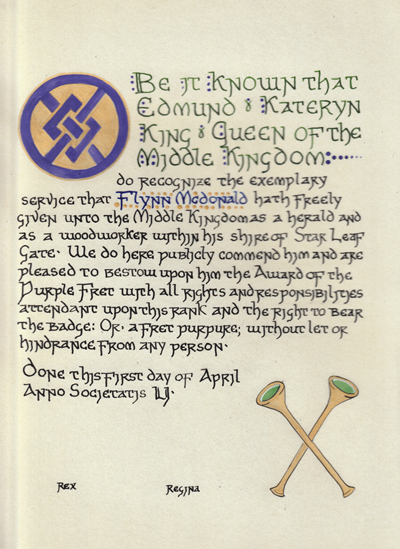 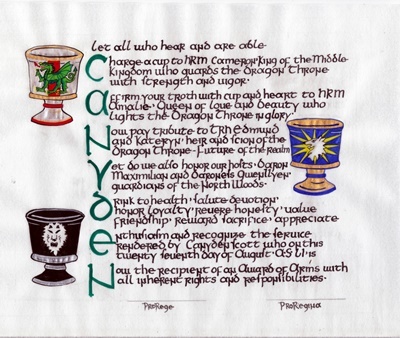 (The Middle Kingdom - Midrealm provides a scroll with each award bestowed by the Crown.) 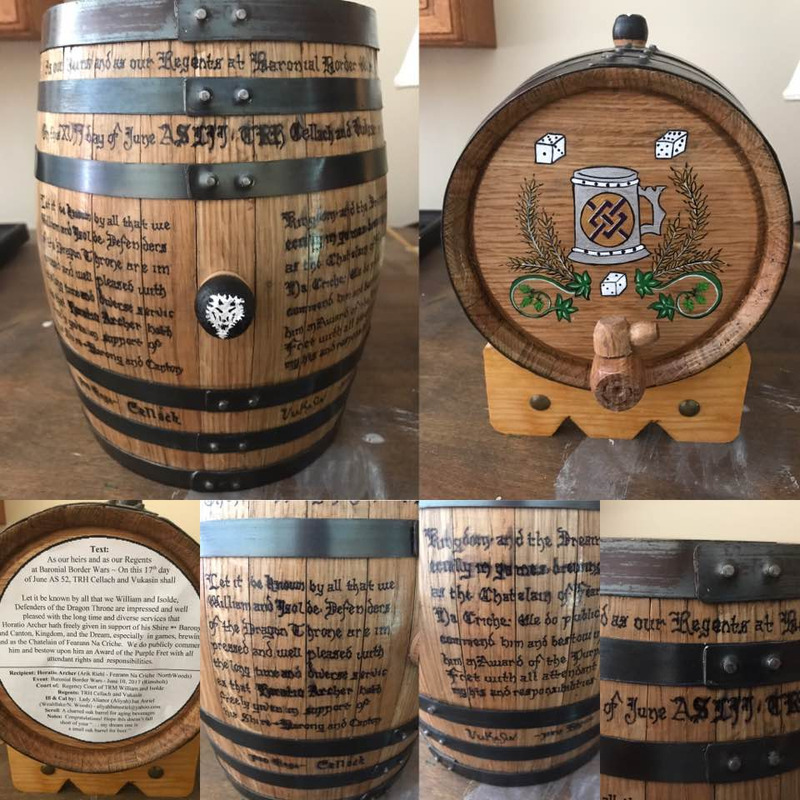 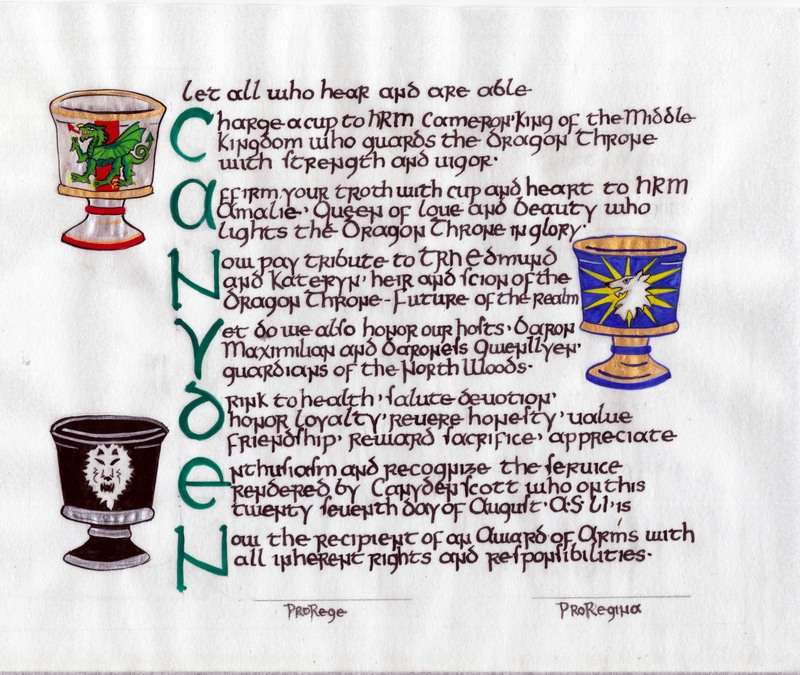 Examples of these are below with links to more information in illumination in the SCA following. 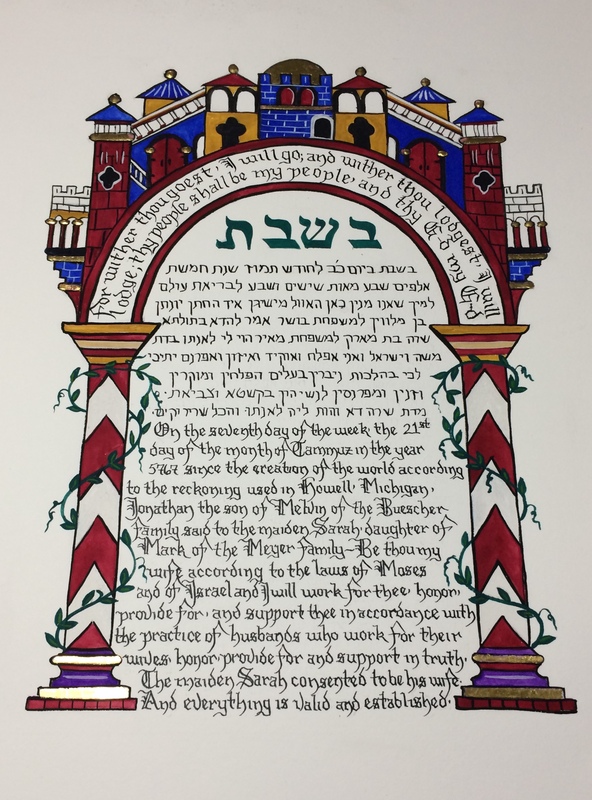 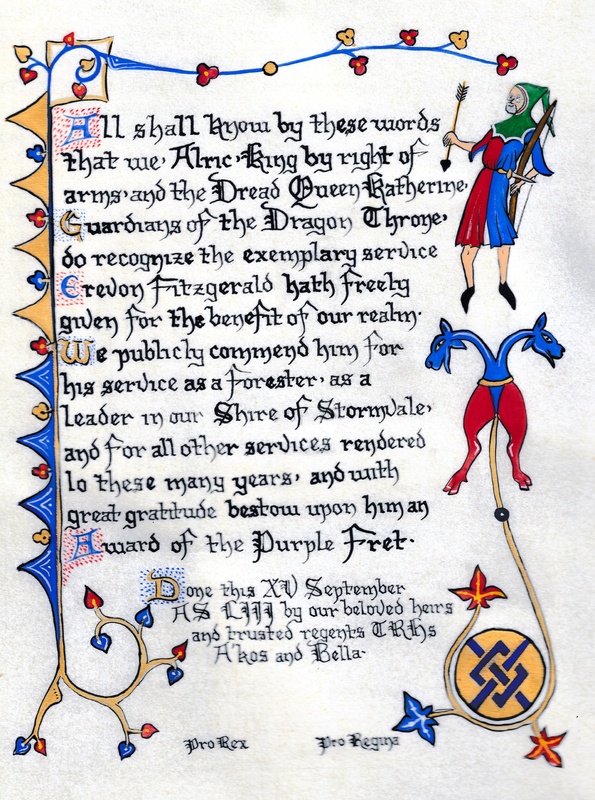 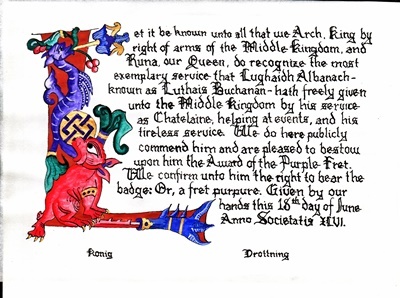 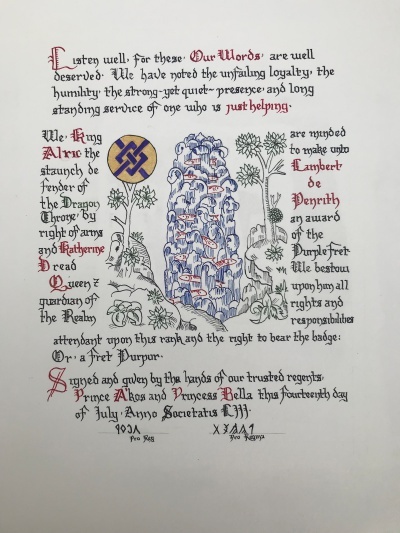 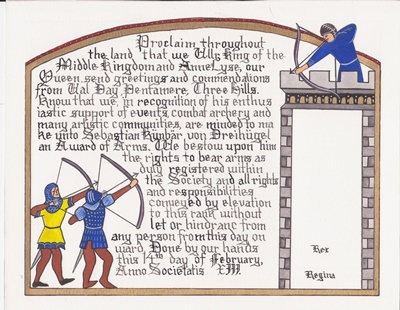 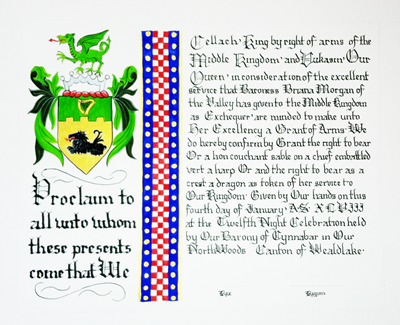 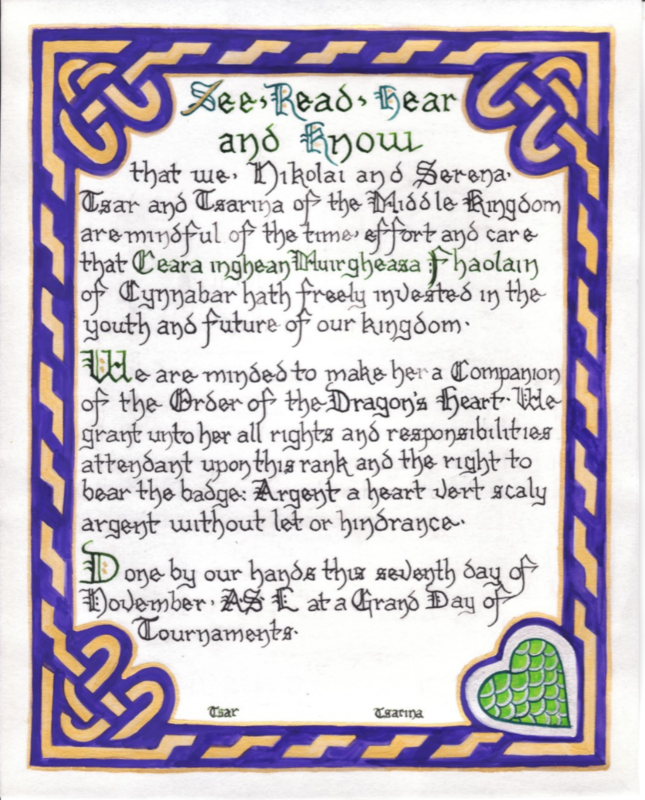 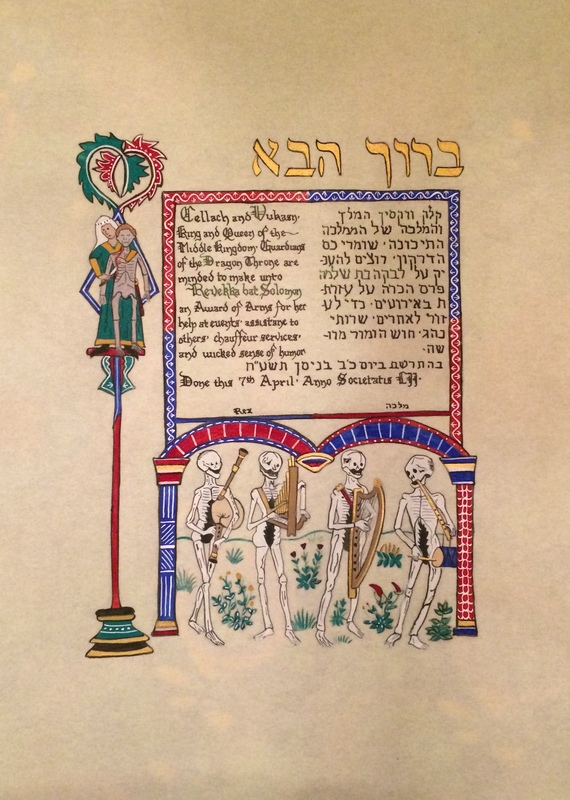 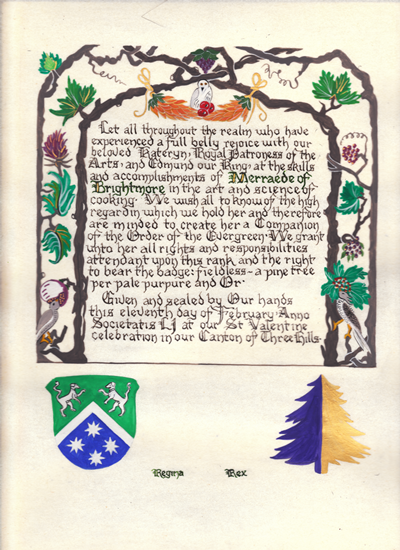 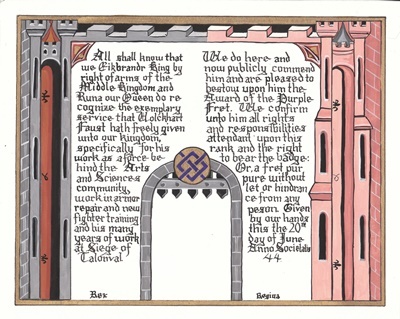 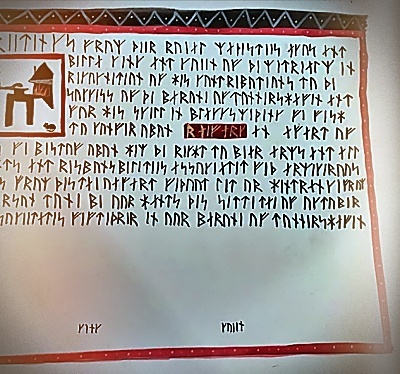 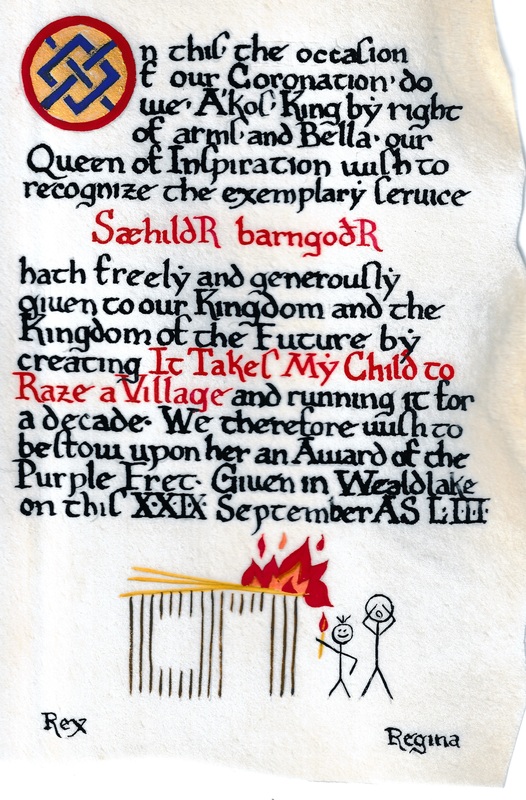 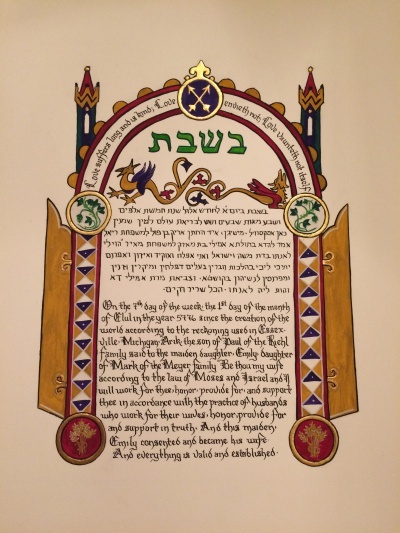 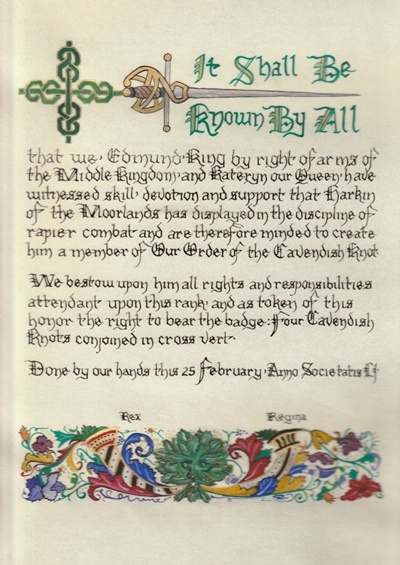 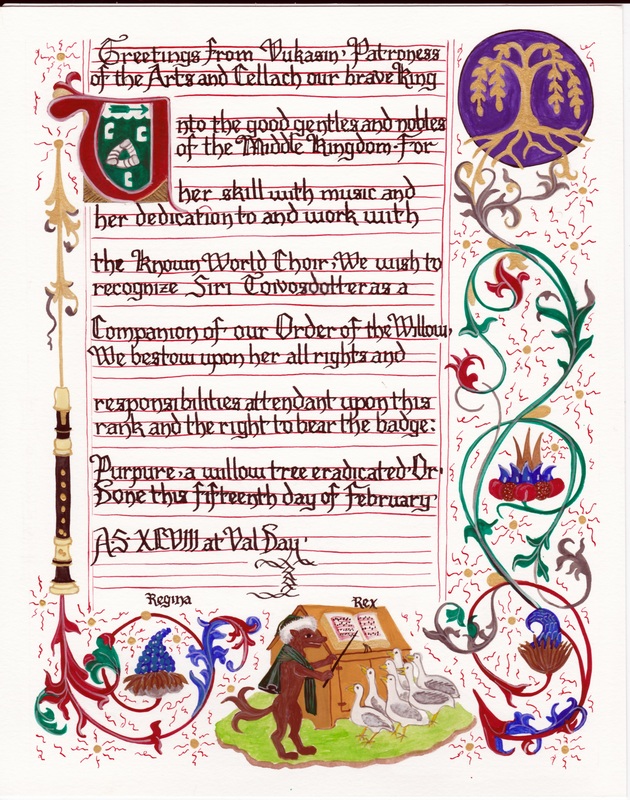 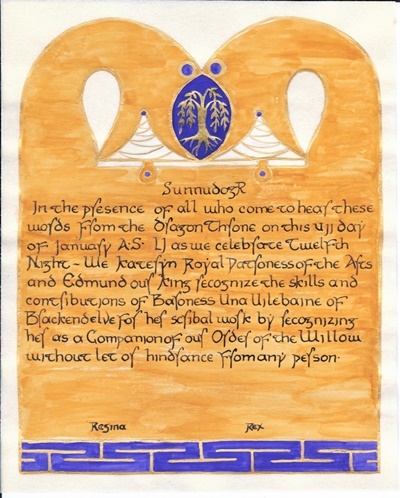 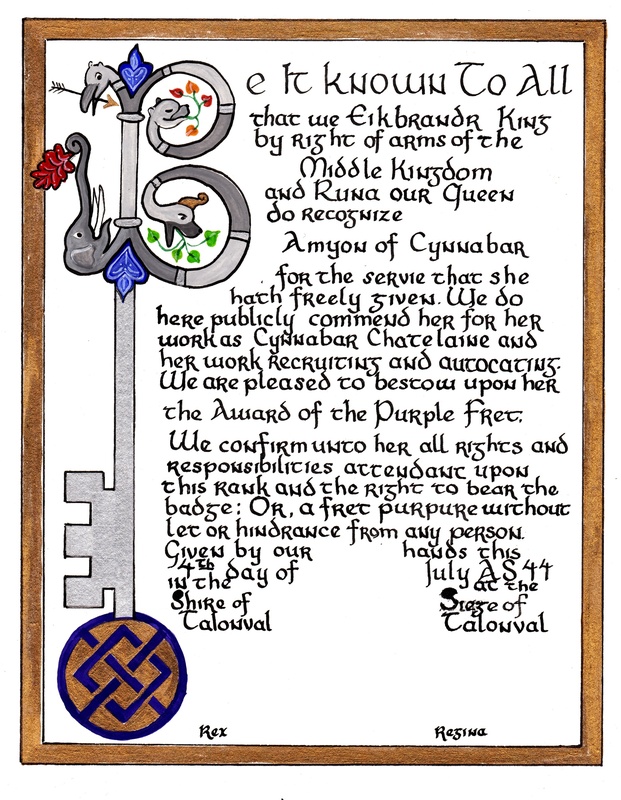 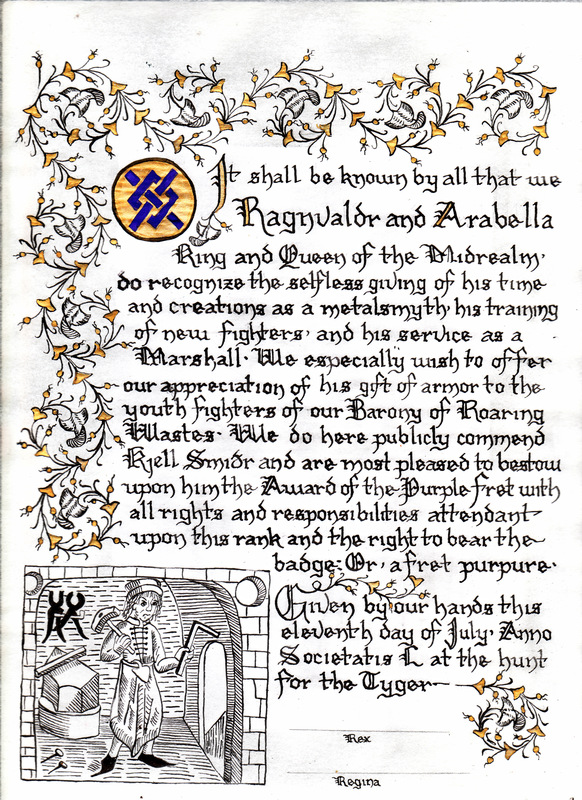 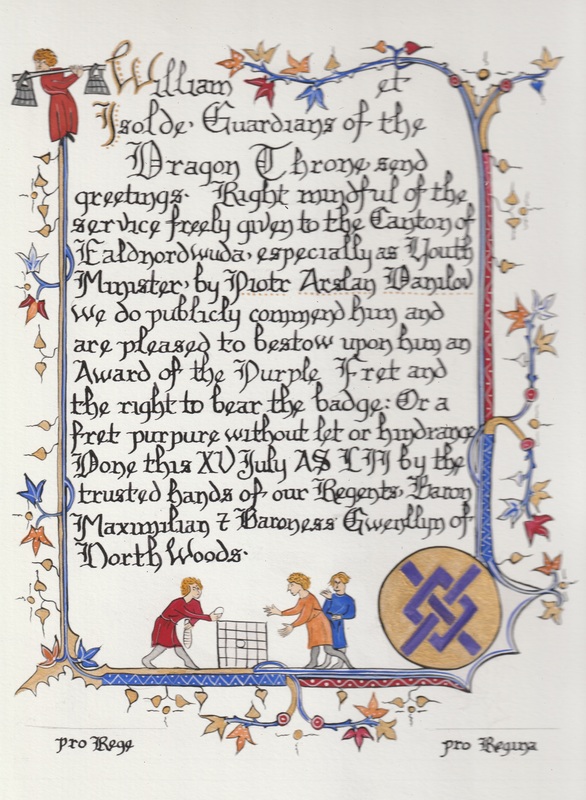 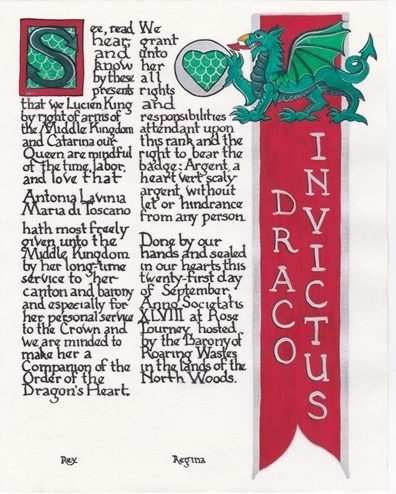 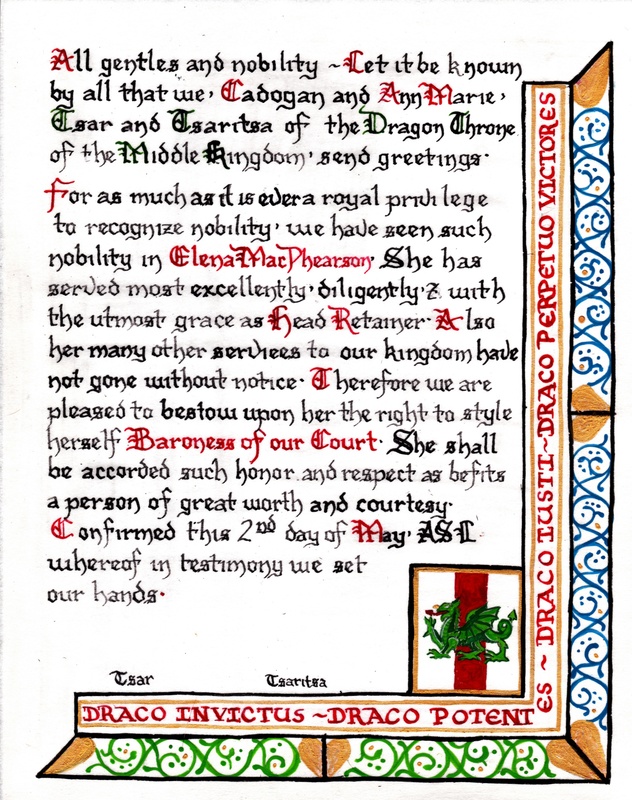 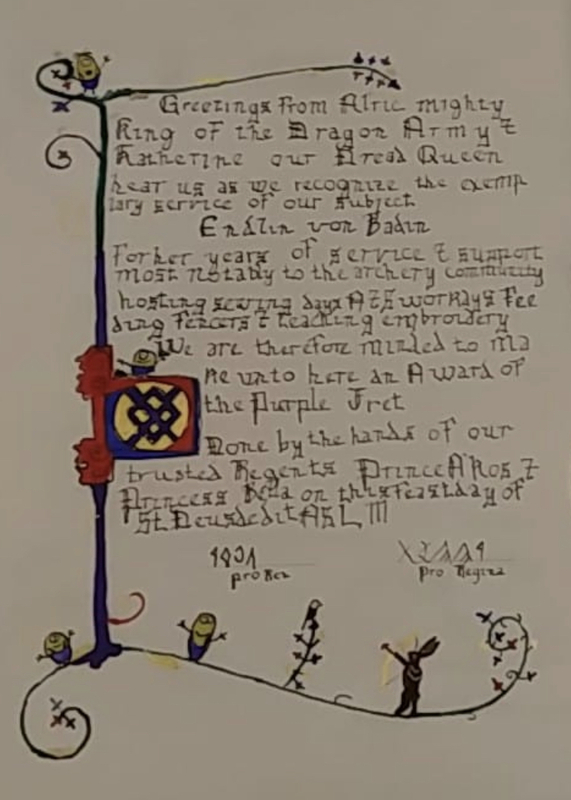 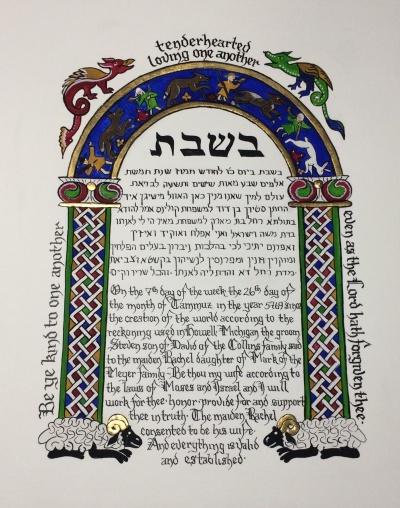 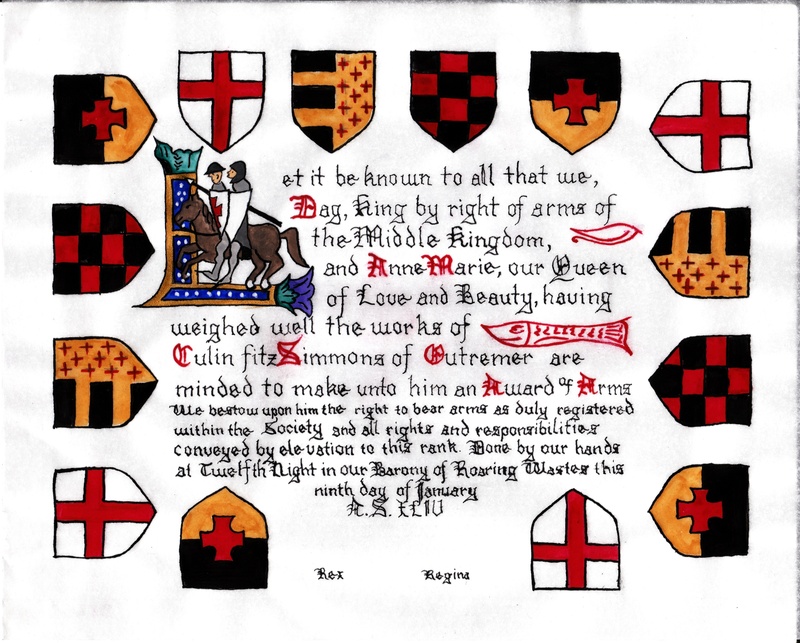 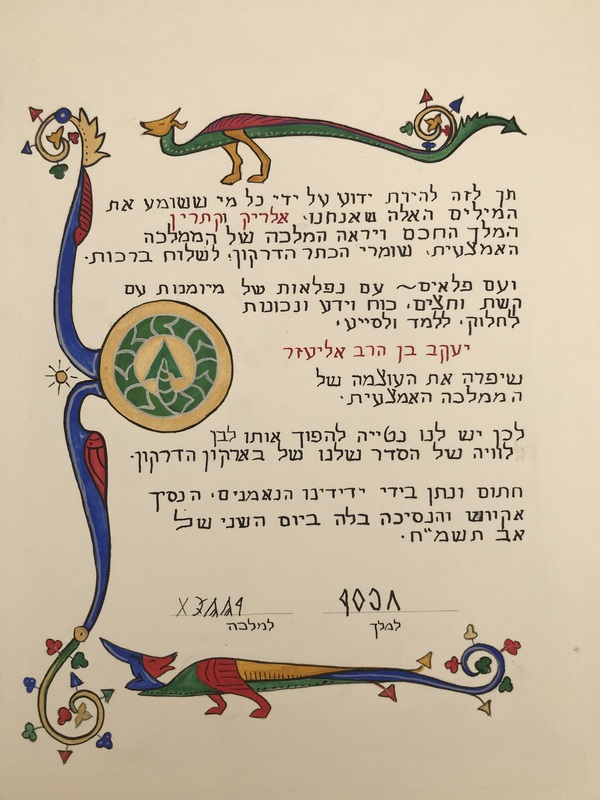 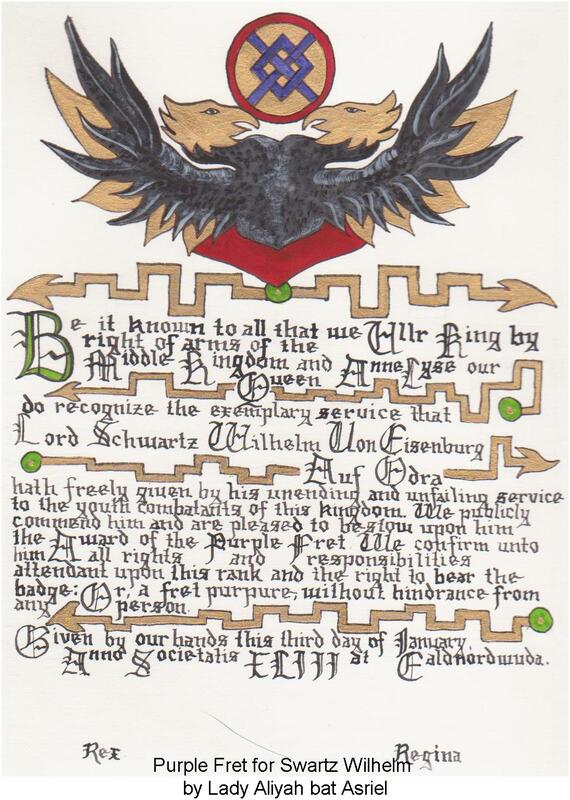 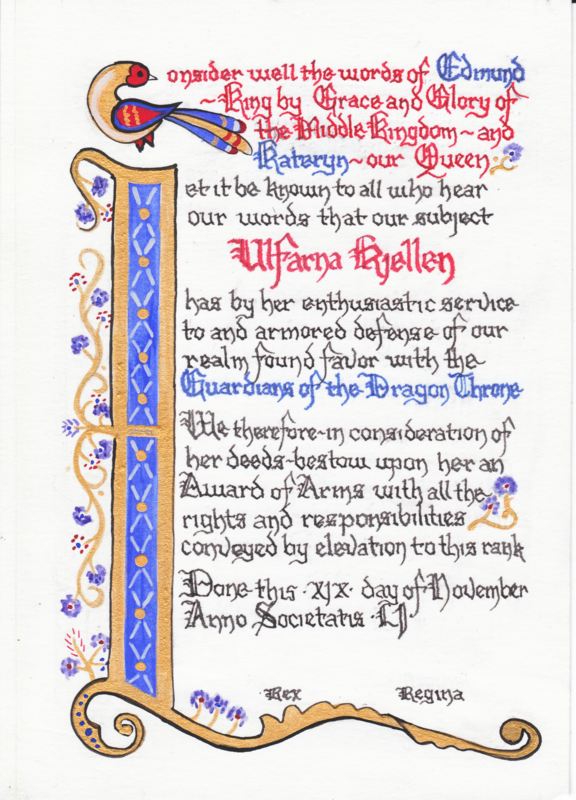 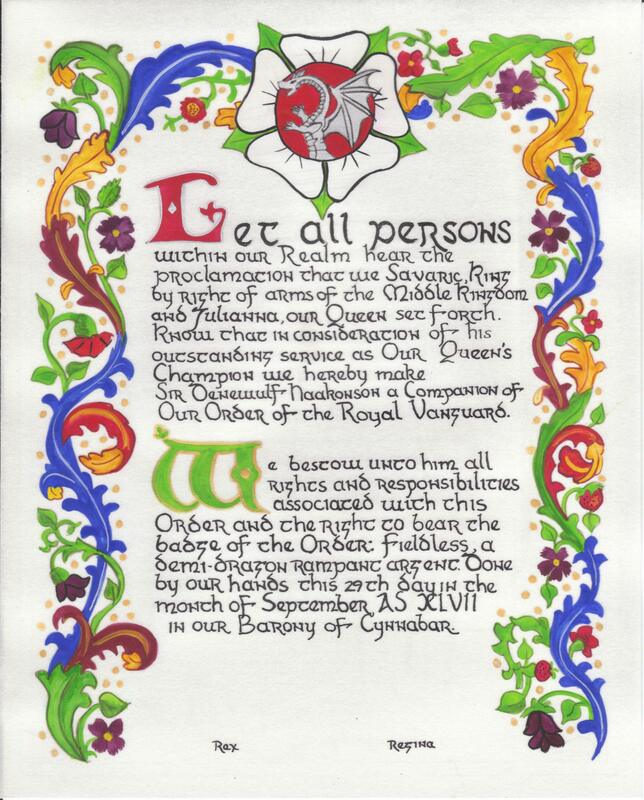 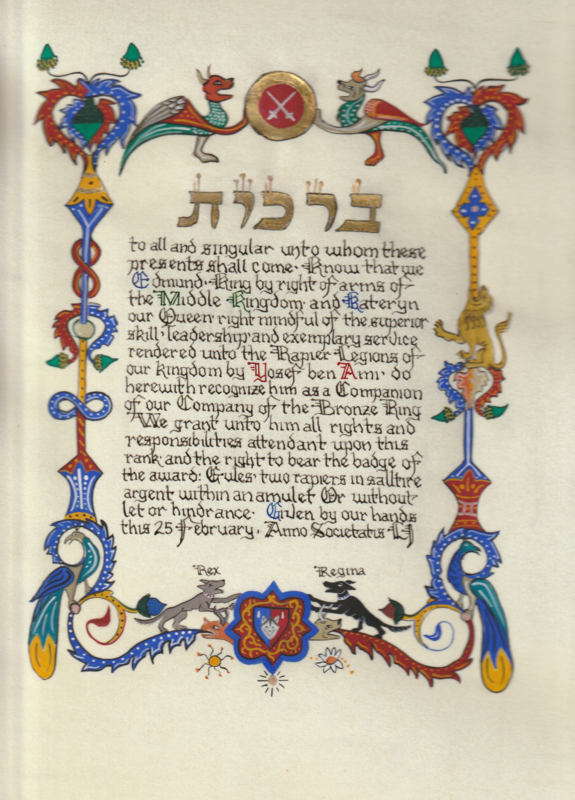 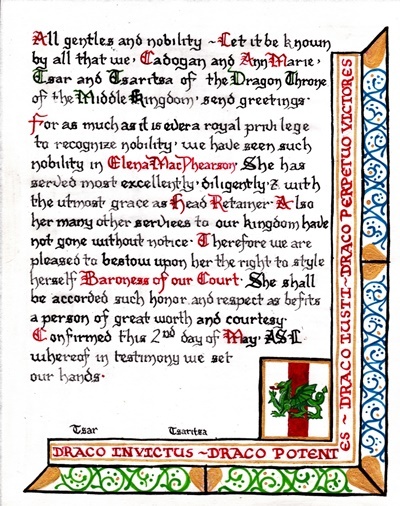 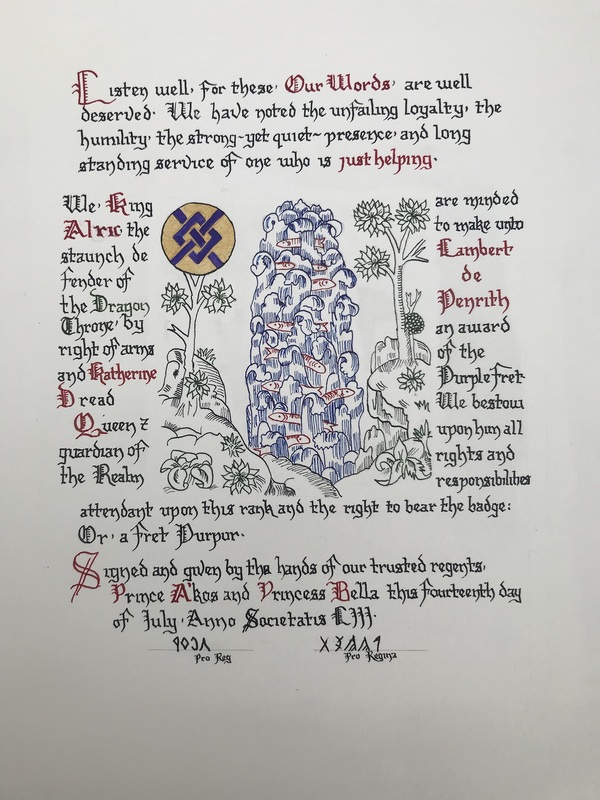 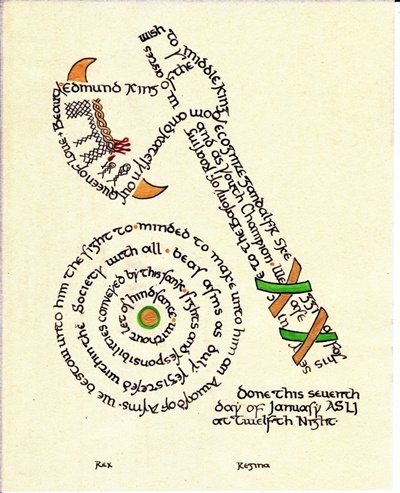 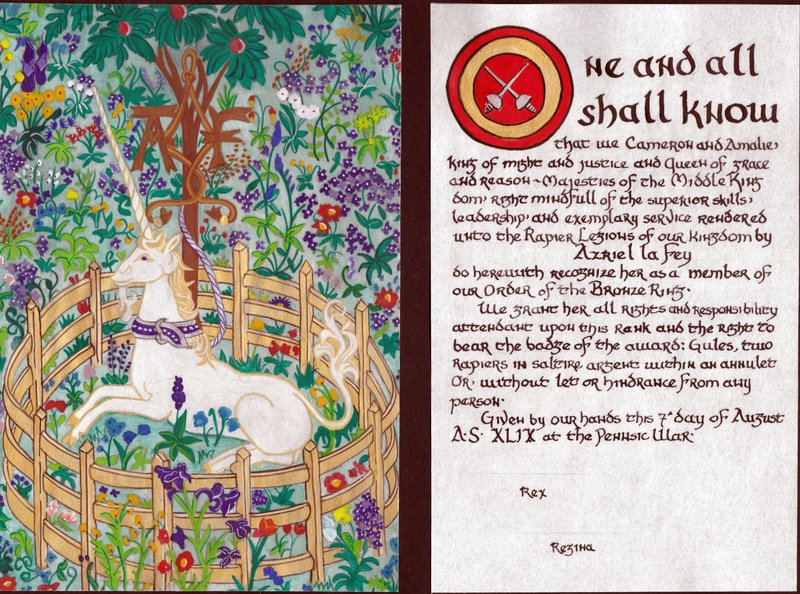 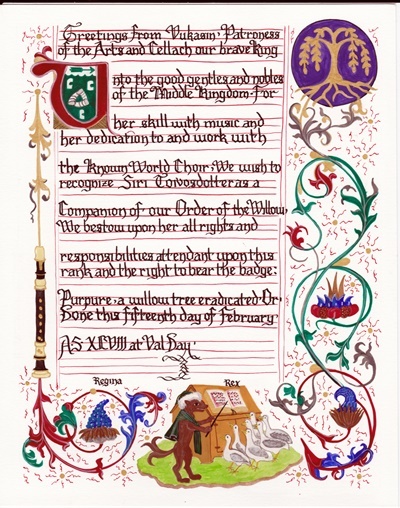 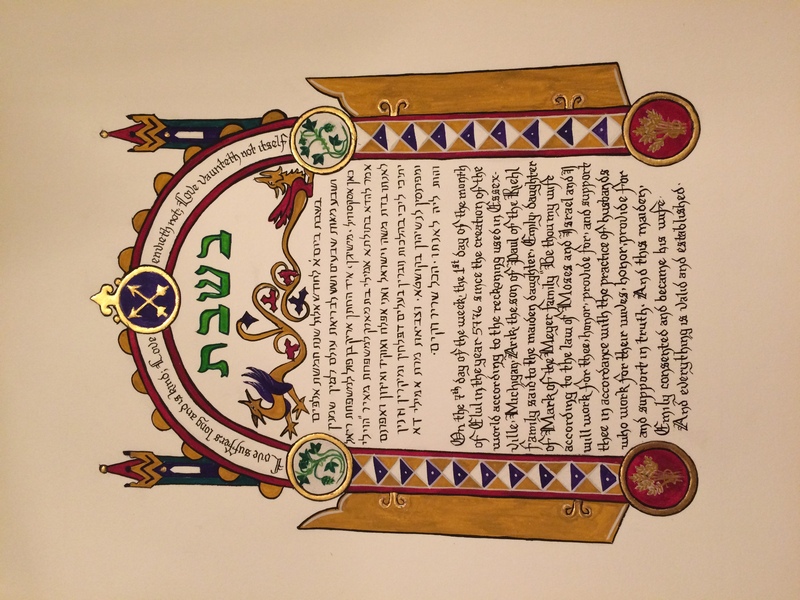 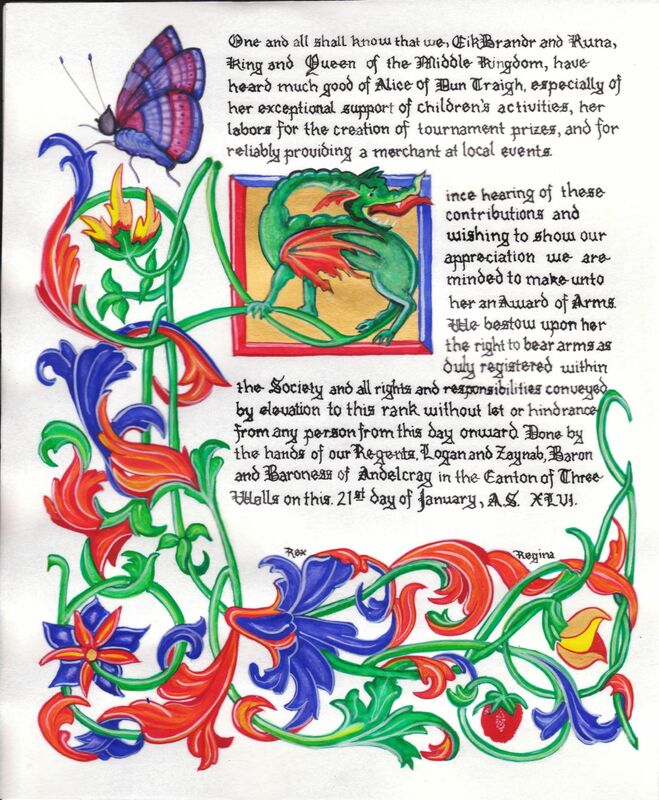 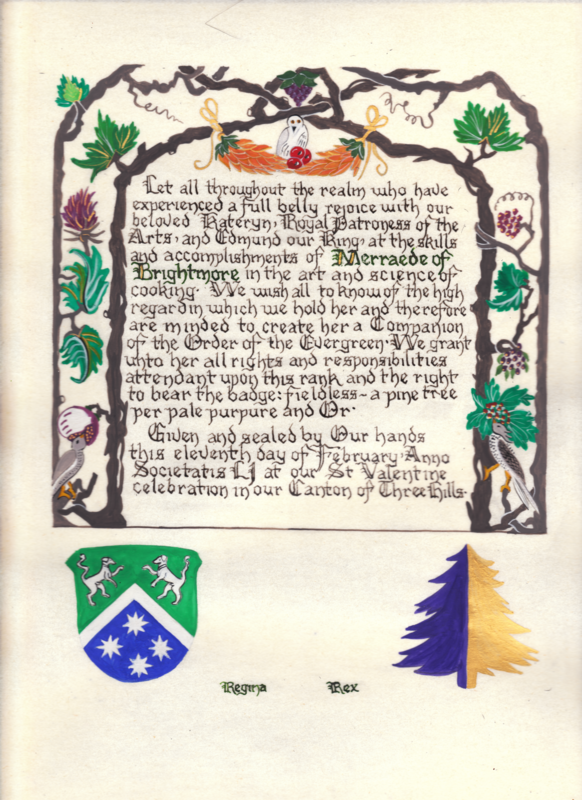 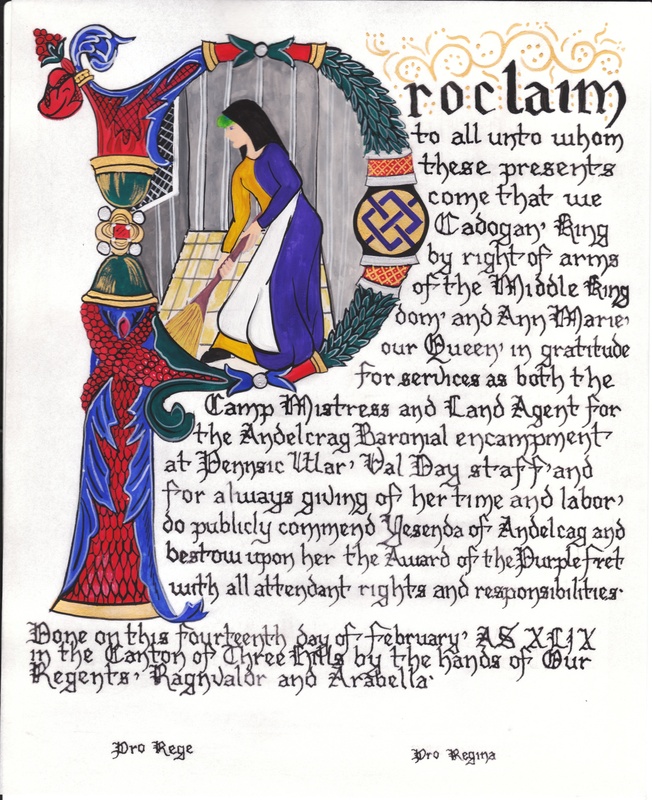 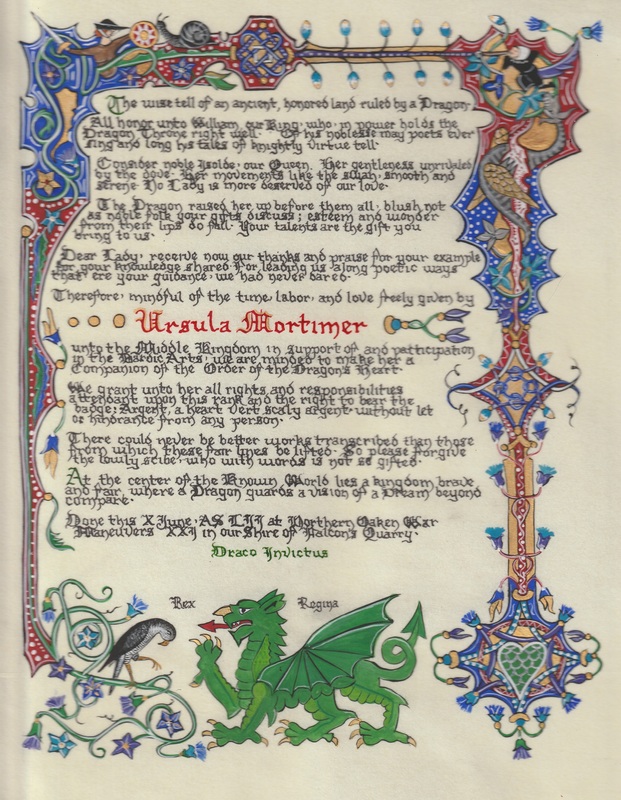 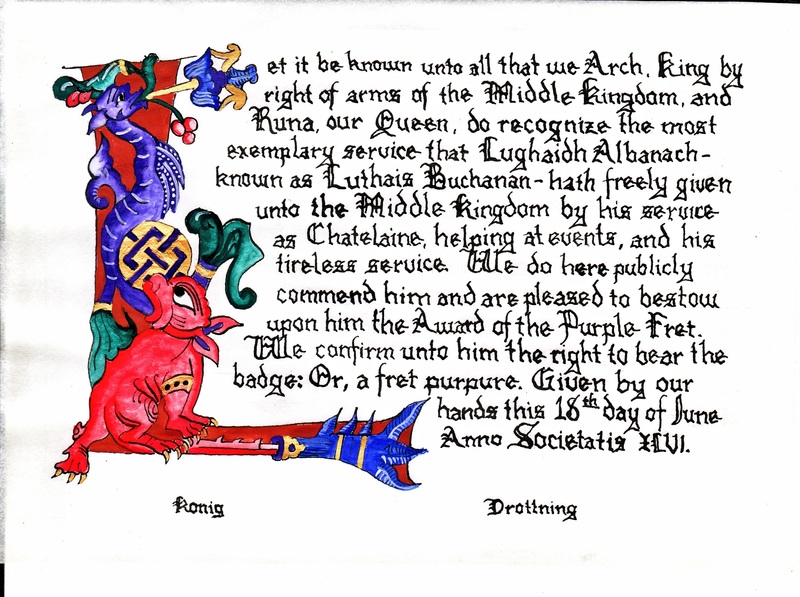 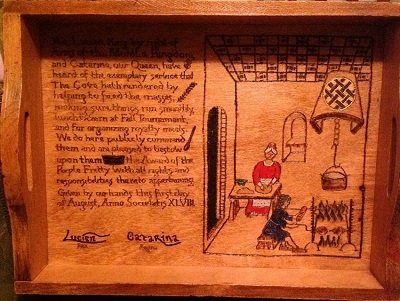 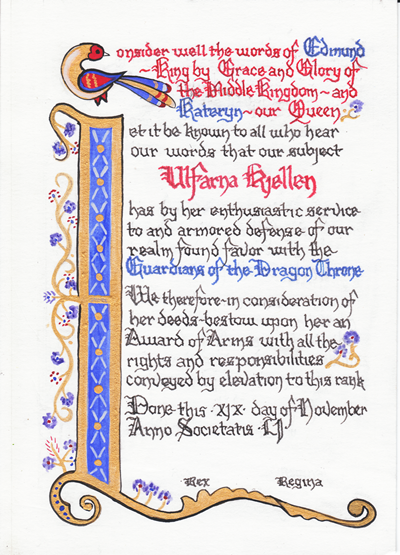 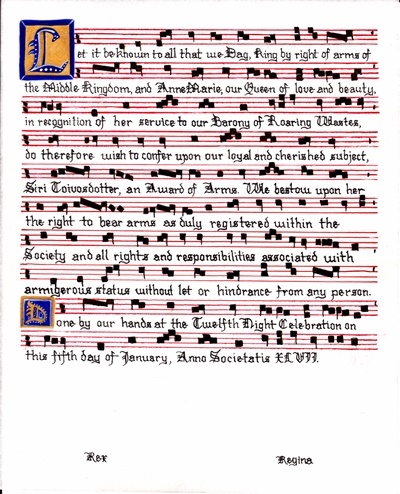 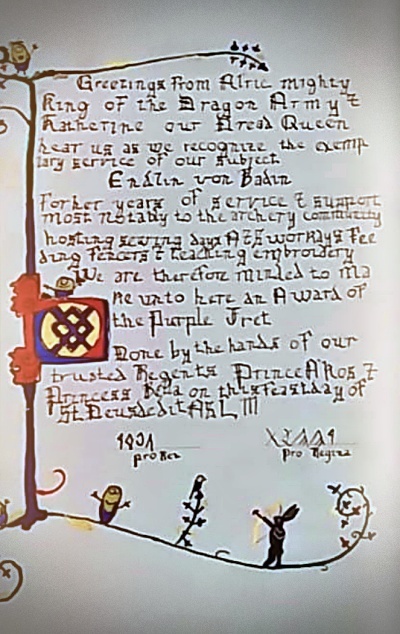 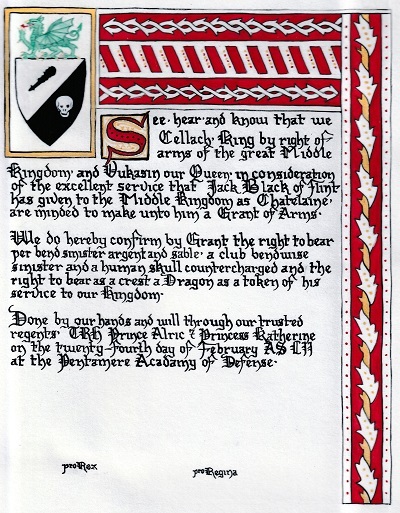 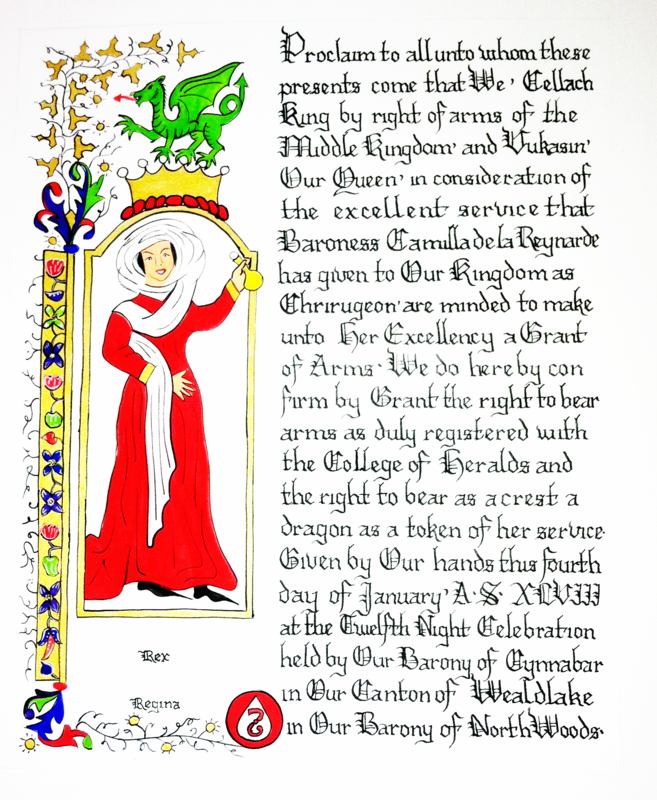 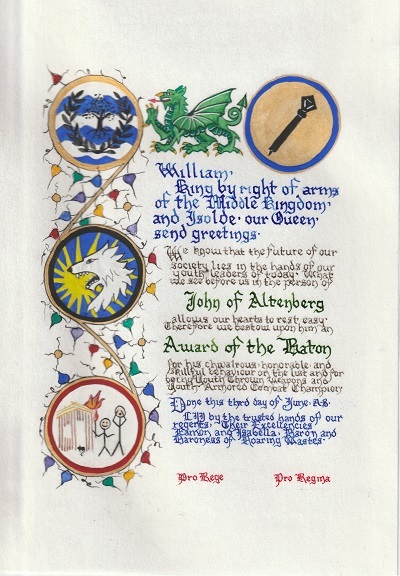 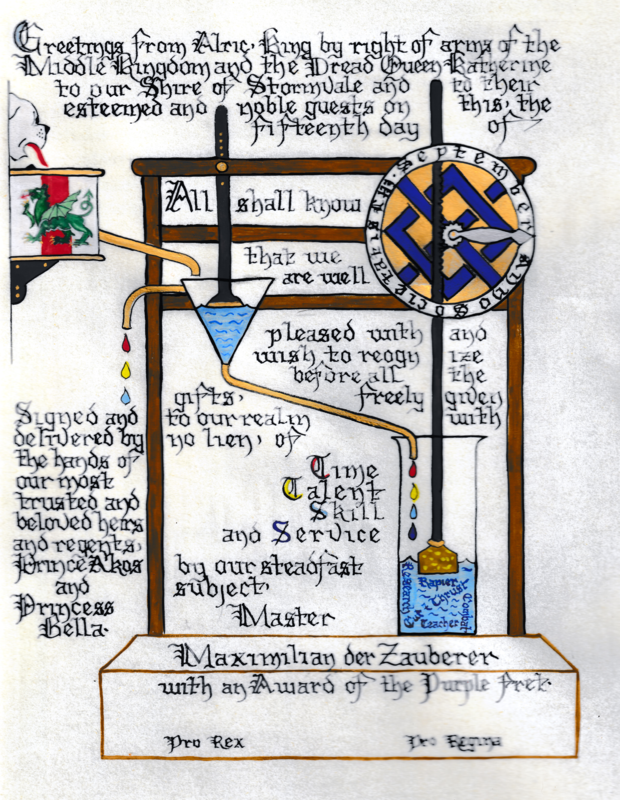 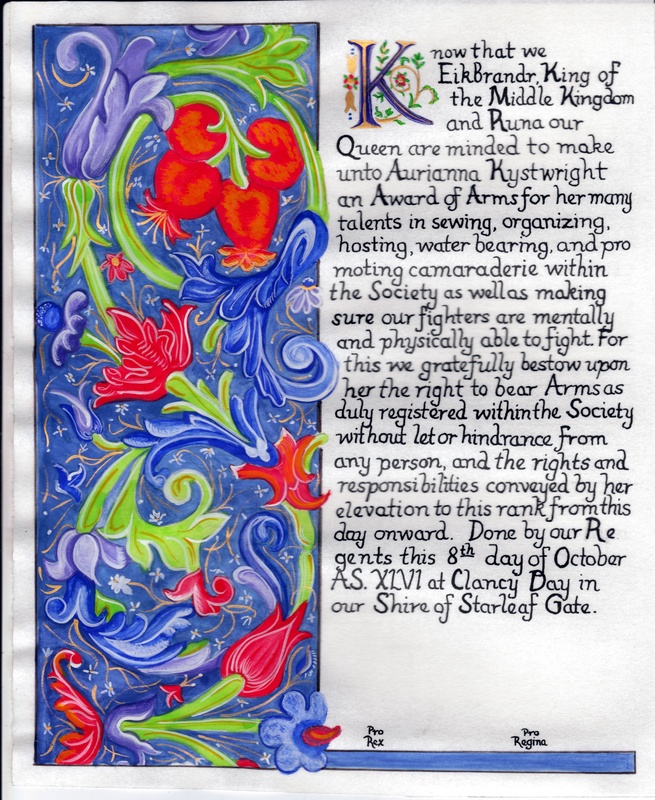 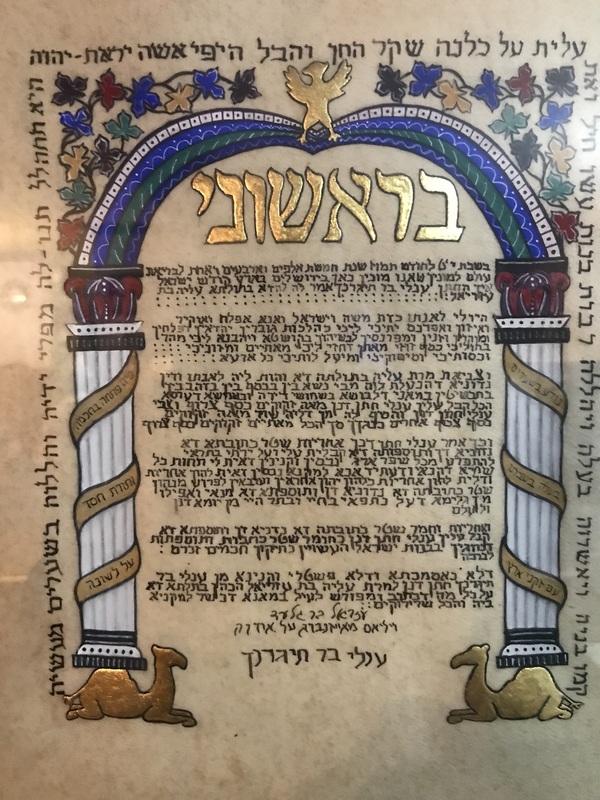 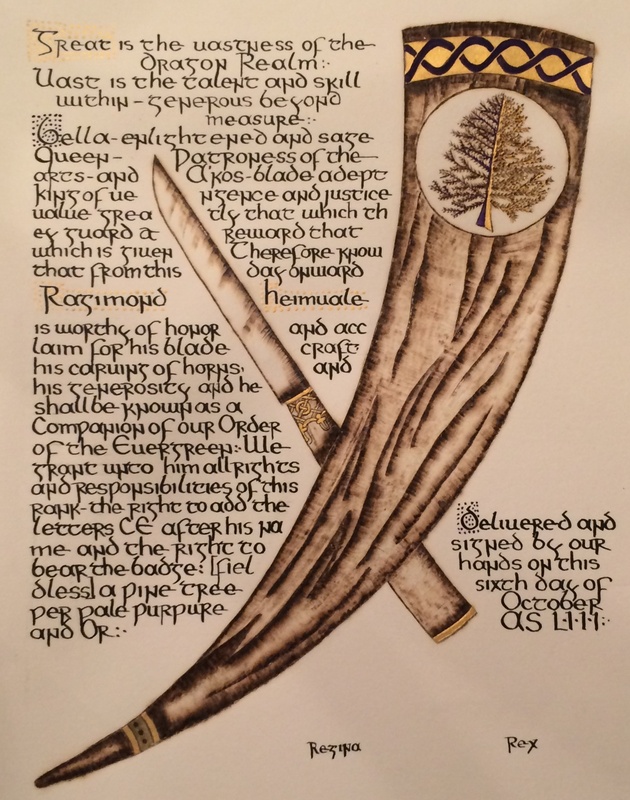 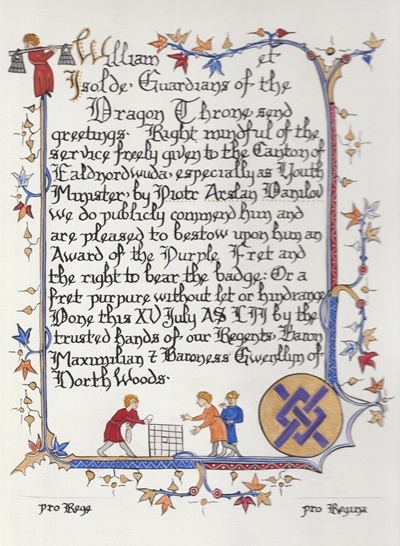 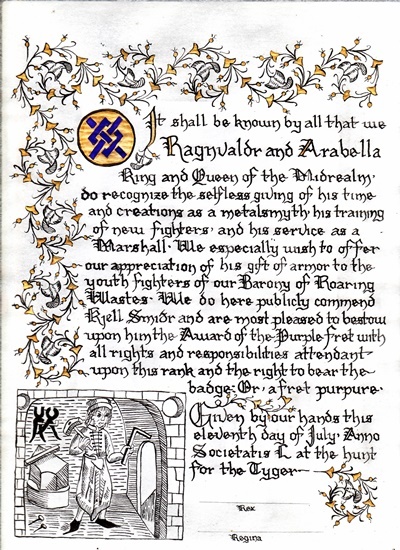 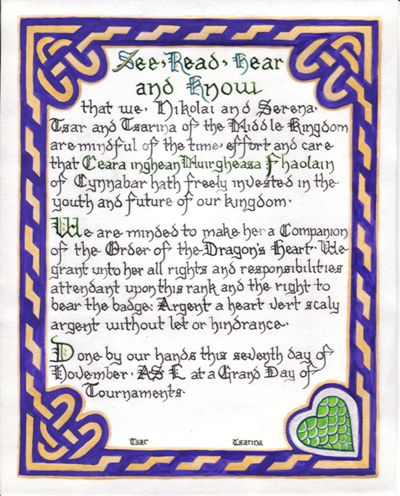 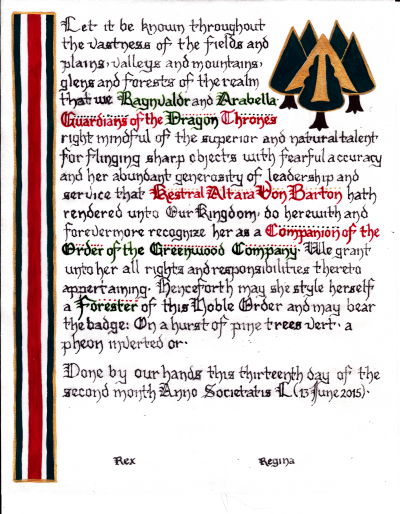 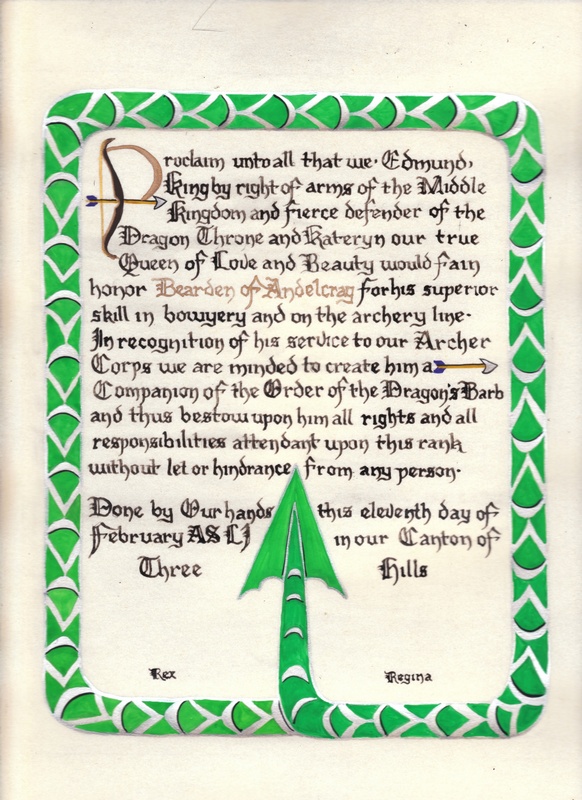 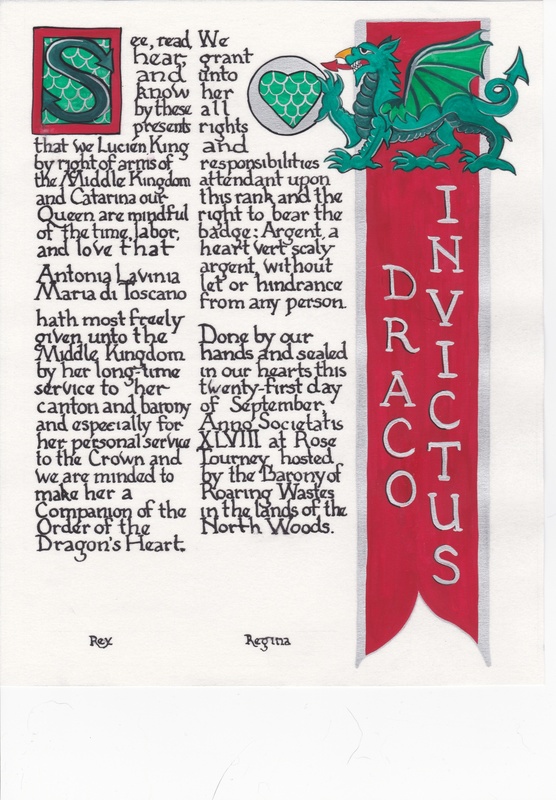 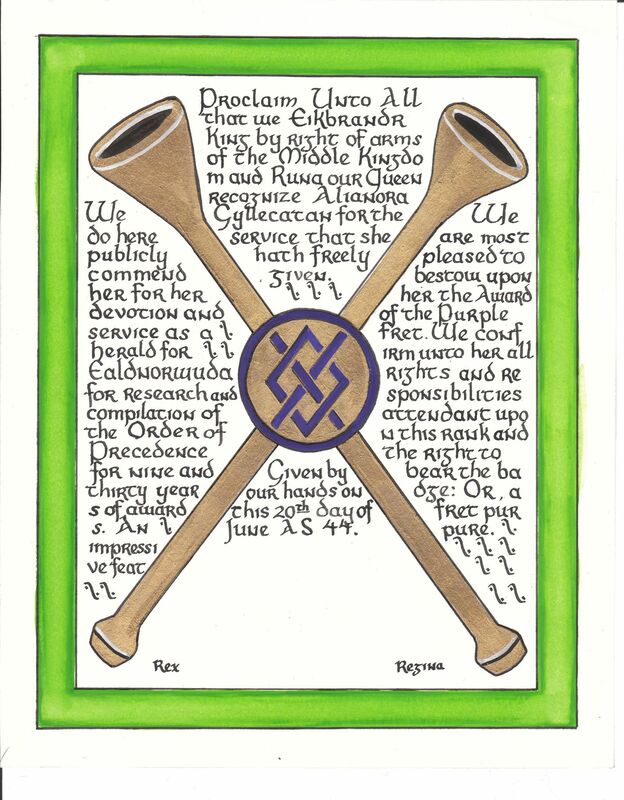 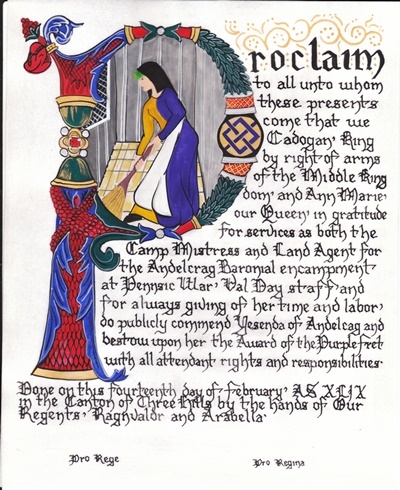 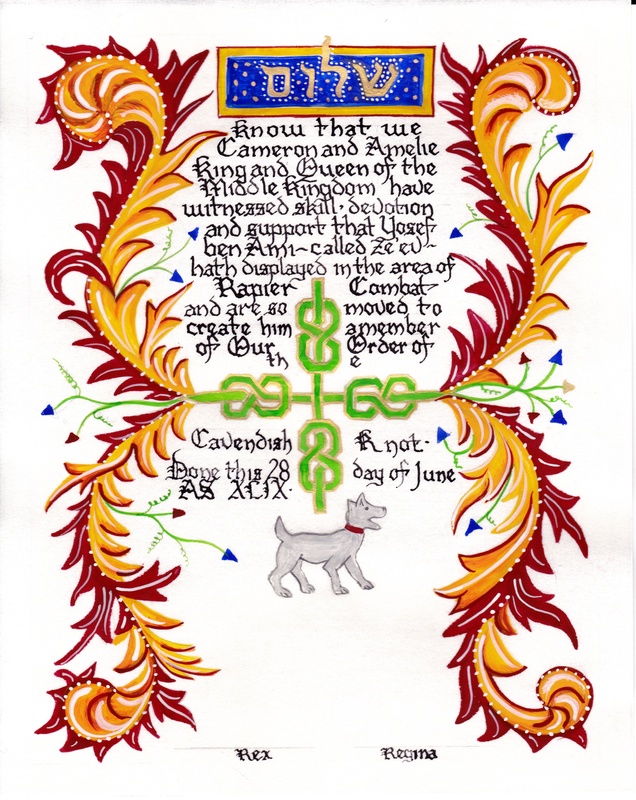 Baroness Alianor bat Asriel has produced over a 100 scrolls. To prevent long load times, you may select a category, then click to open the scrolls she produced for that set of awards. 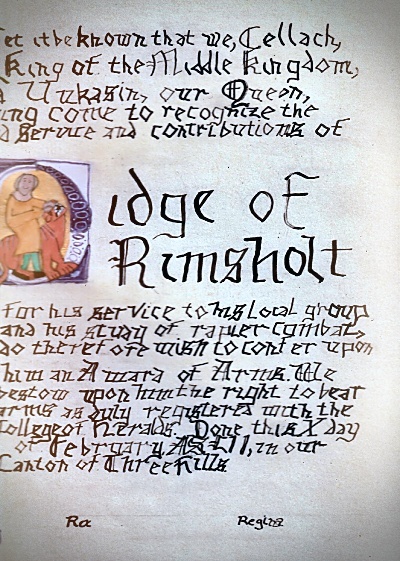 Click on an award image for a larger image of the scroll. 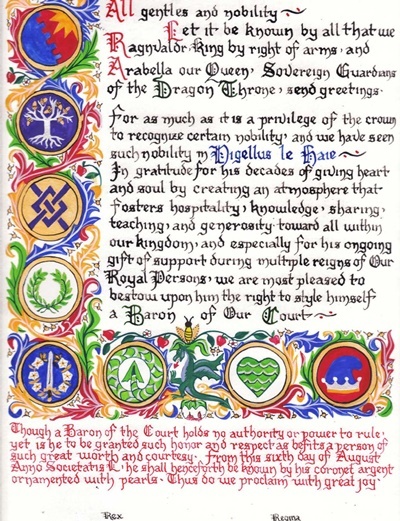 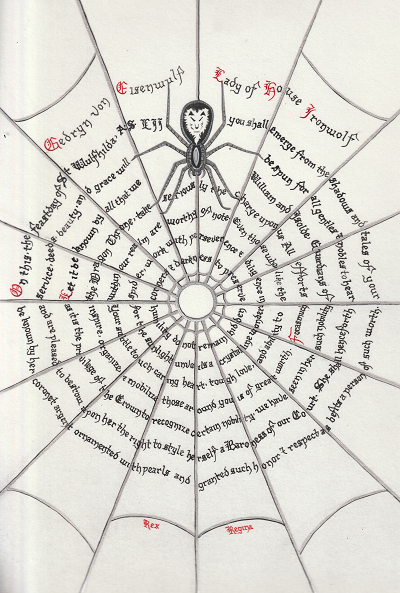 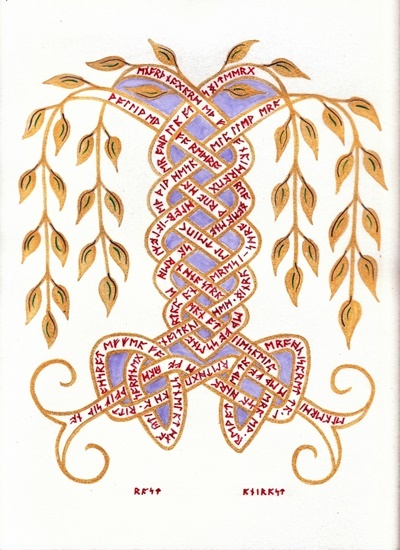 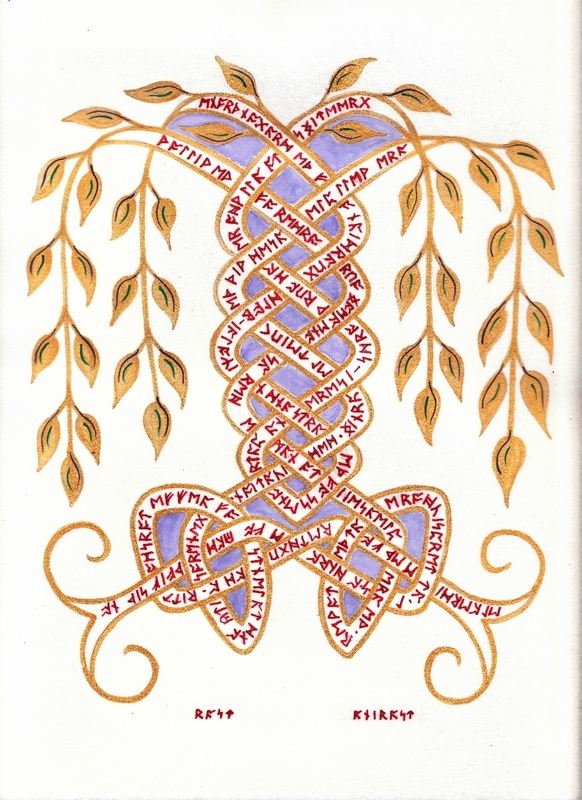 To see all of her scrolls in the order they were created, click here.